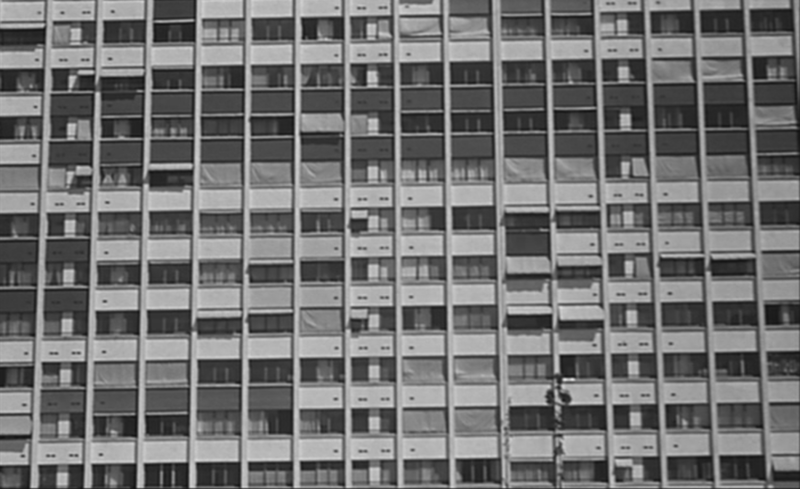 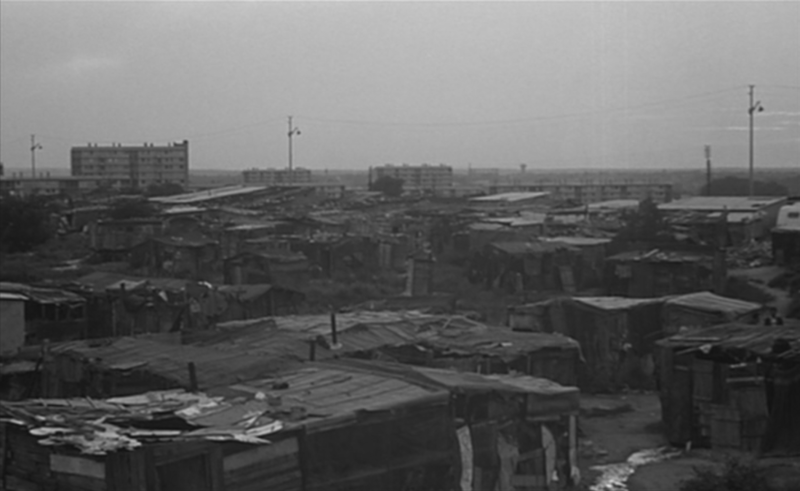 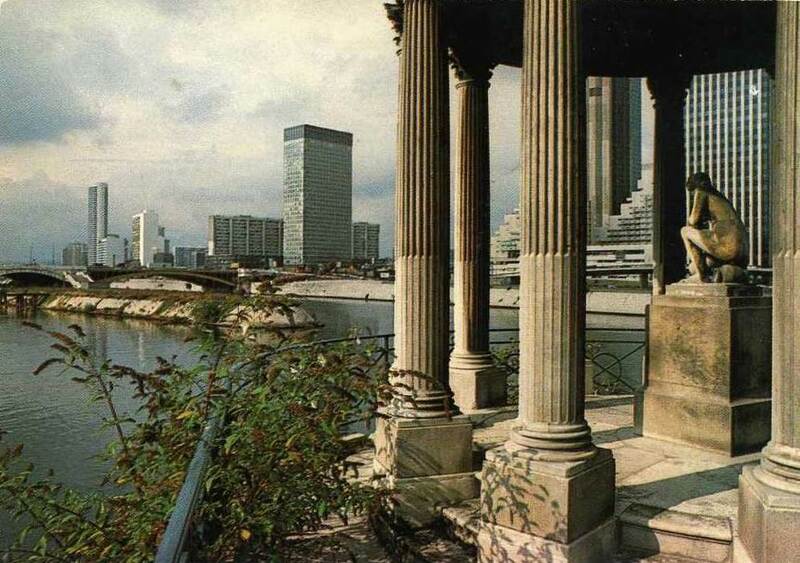 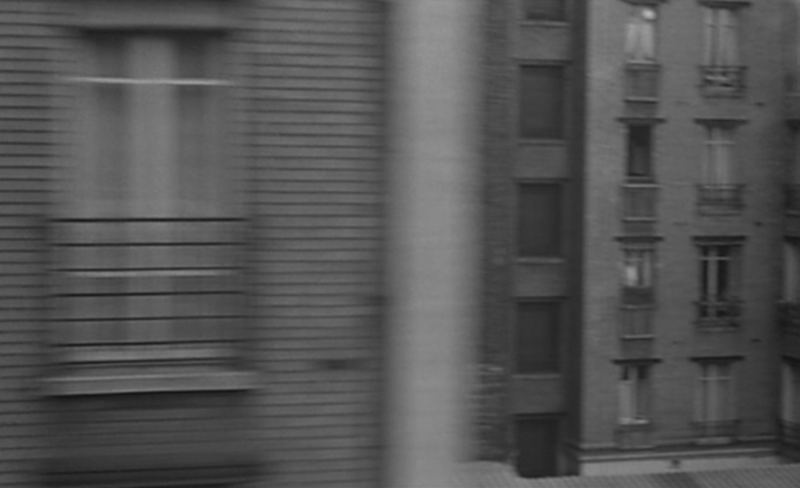 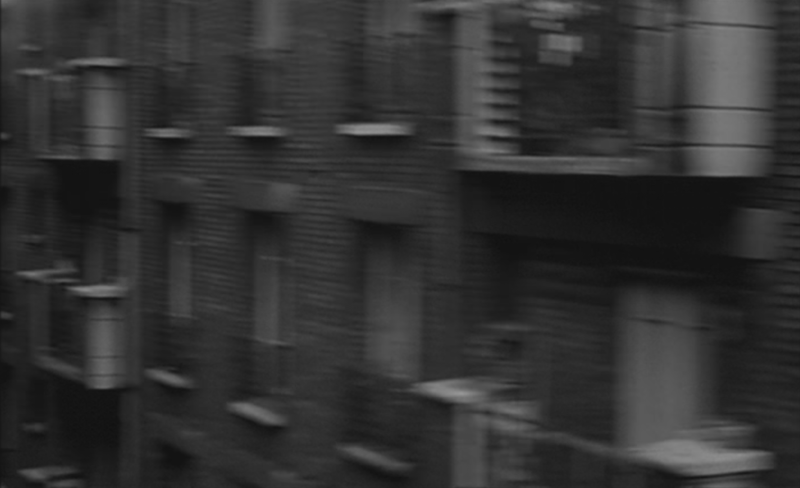 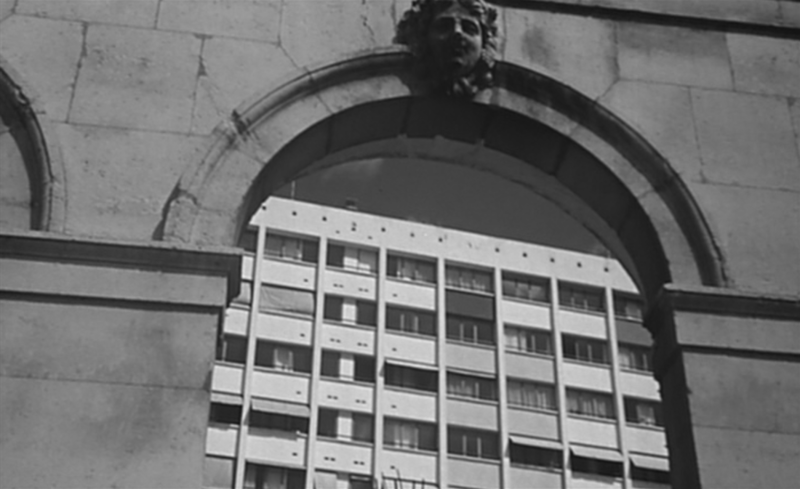 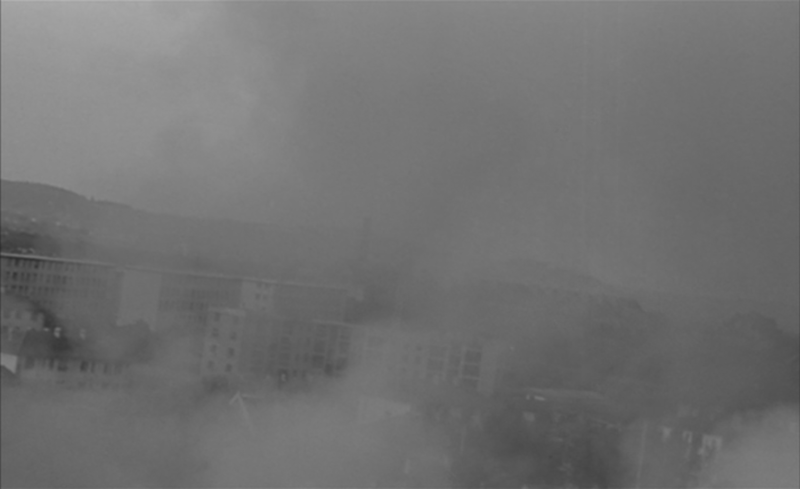 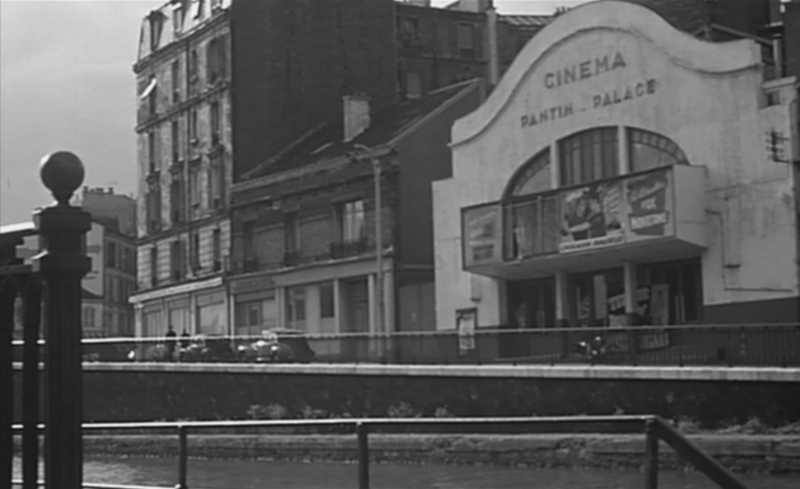 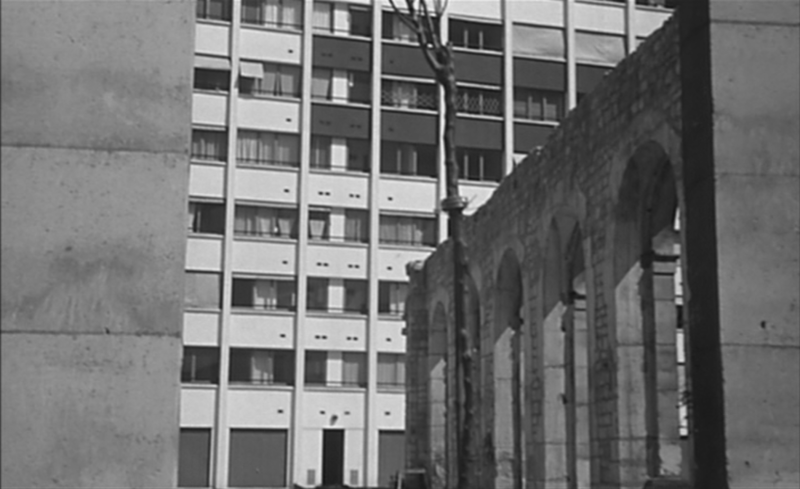 Maurice Pialat's film shows the banlieue of Paris in about seventy exterior views in different places. 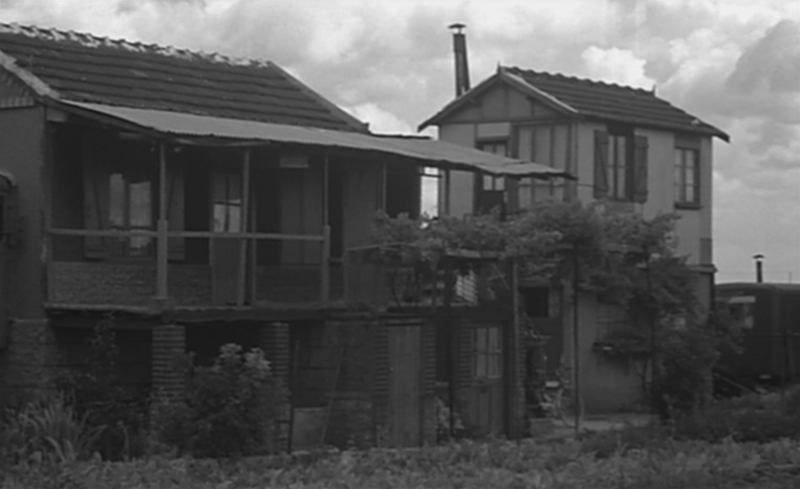 These places are the object of this post, which is basically a listing. 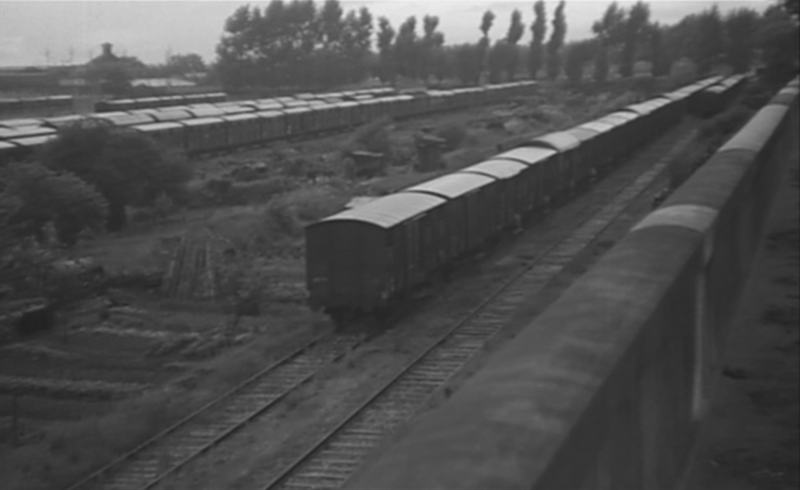 I have only been able to identify precisely about twenty of them, but even that number gives a clear indication - see right - of the topographical scope of this nineteen-minute film. 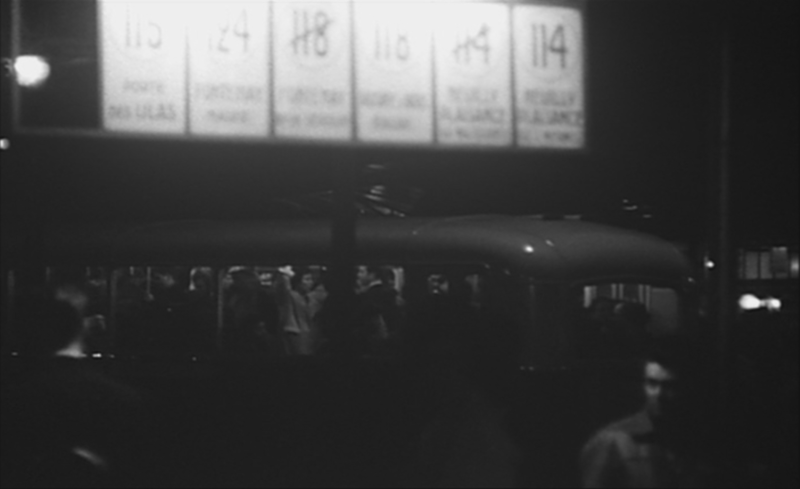 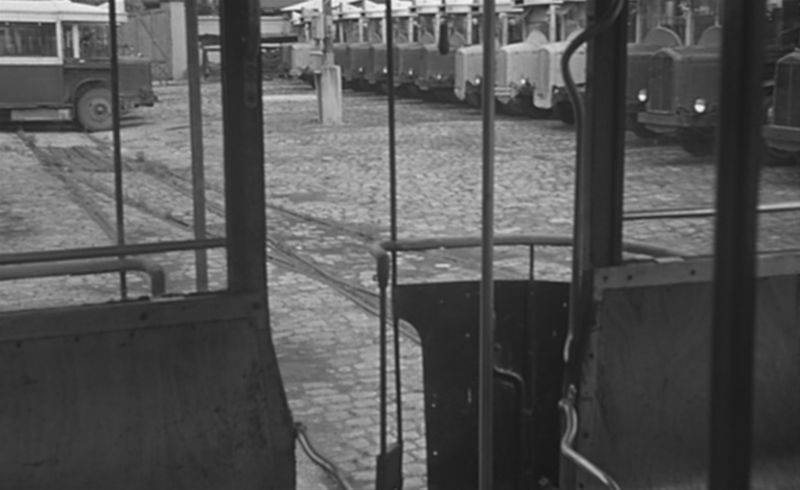 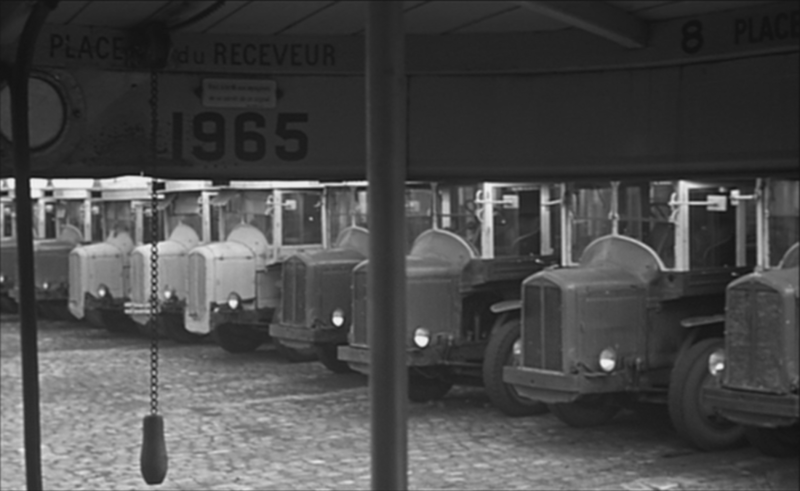 Actually, here, the film has already left Paris, since this must be Vincennes - the only possible point of convergence for the buses listed. 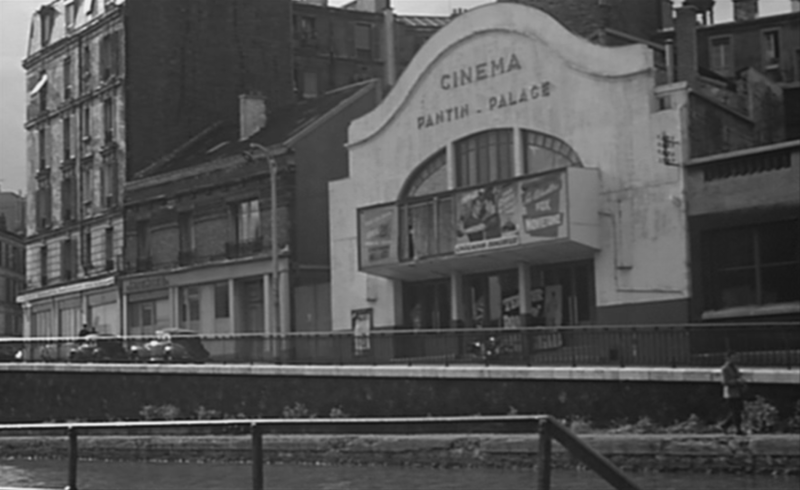 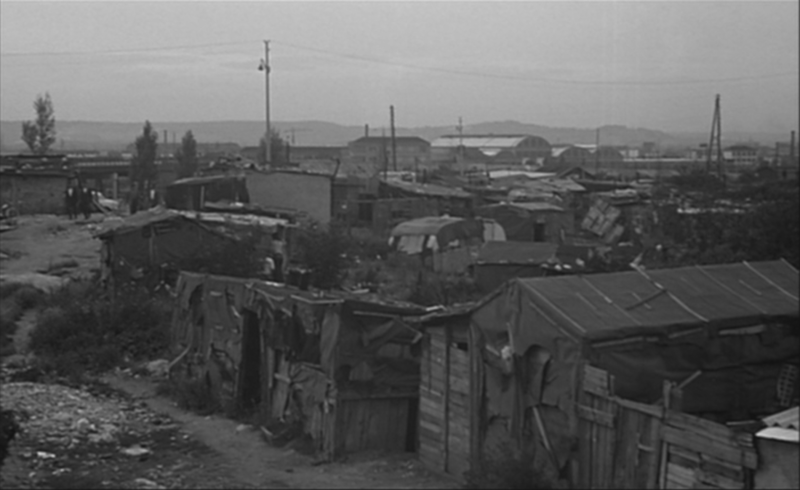 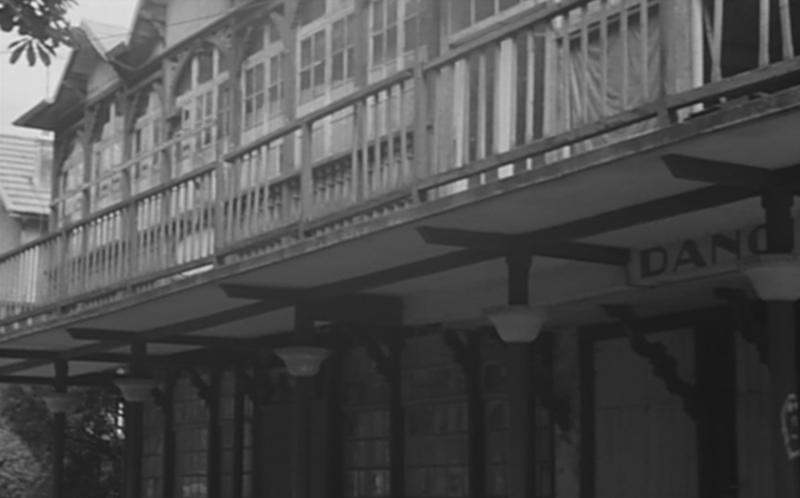 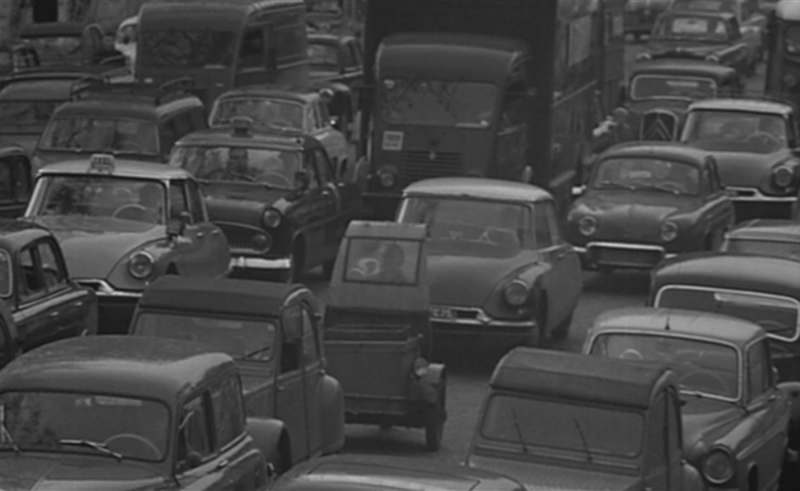 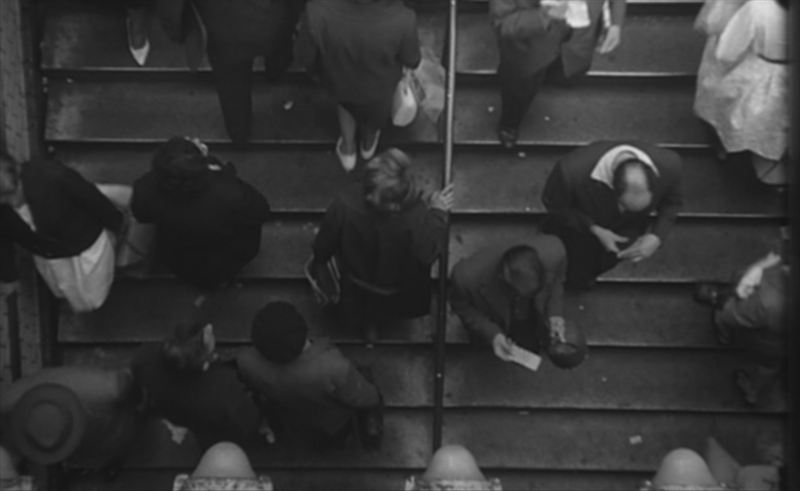 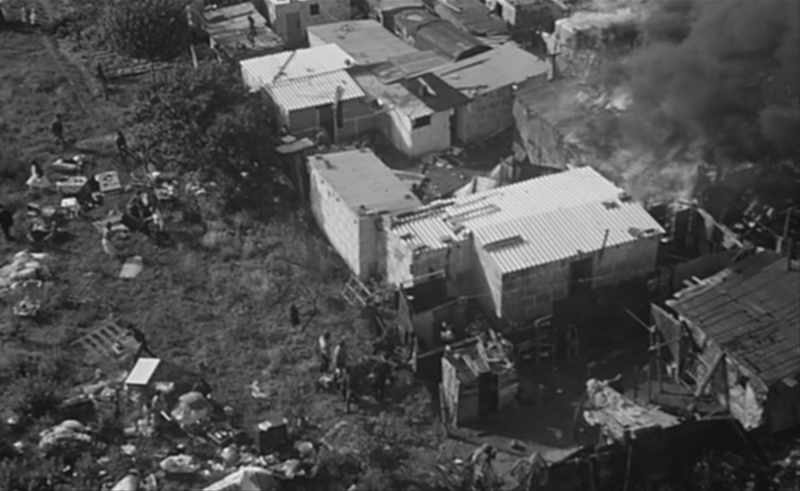 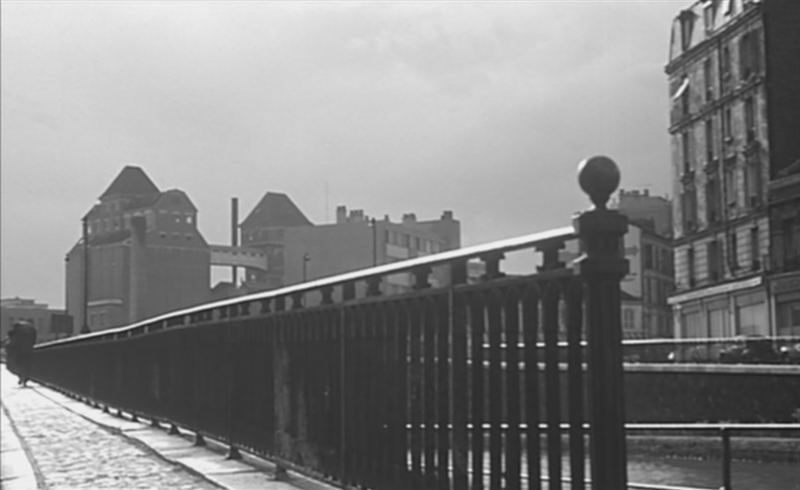 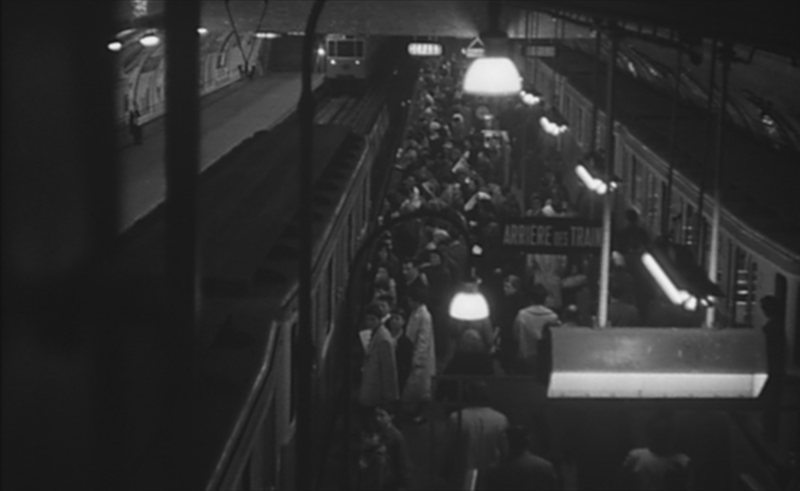 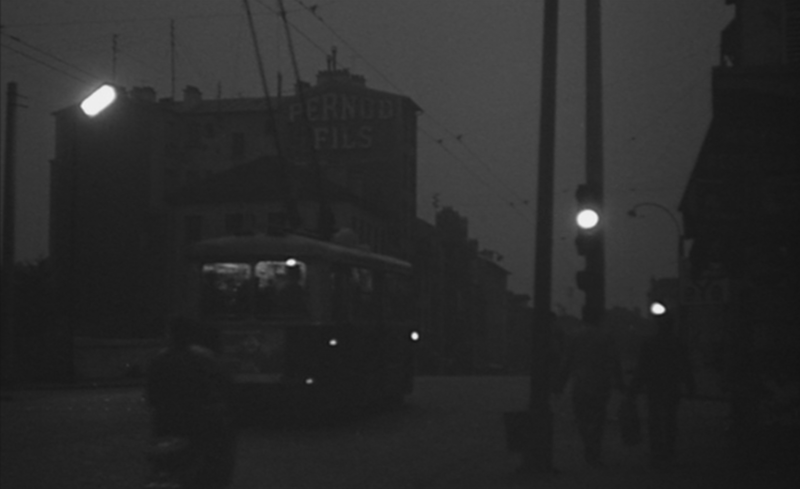 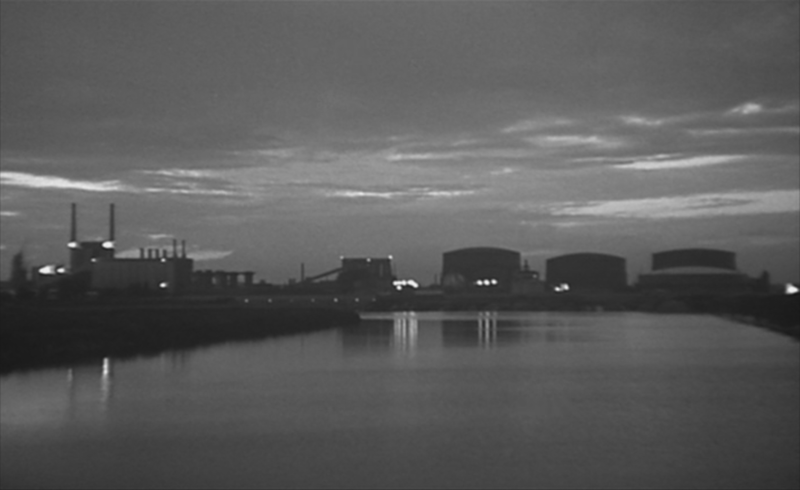 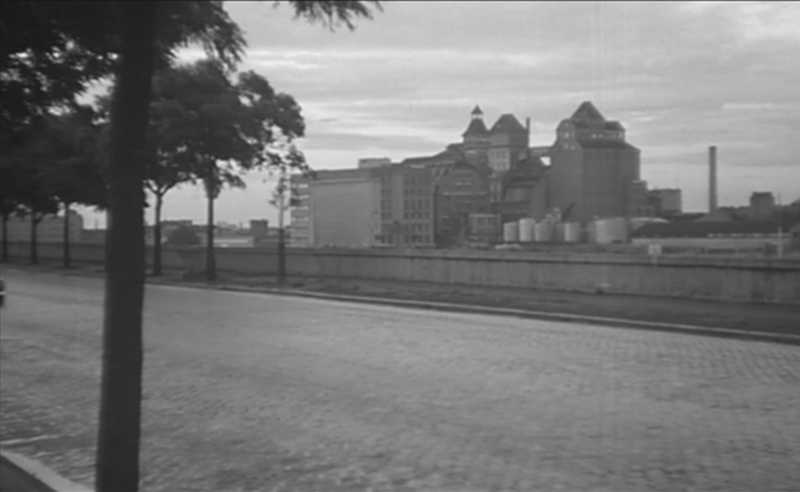 Some of the other locations glimpsed in the opening sequence may also be already at the edges of the city, but the general and generic impression it creates is of a busy metropolis from which we shall be escaping. 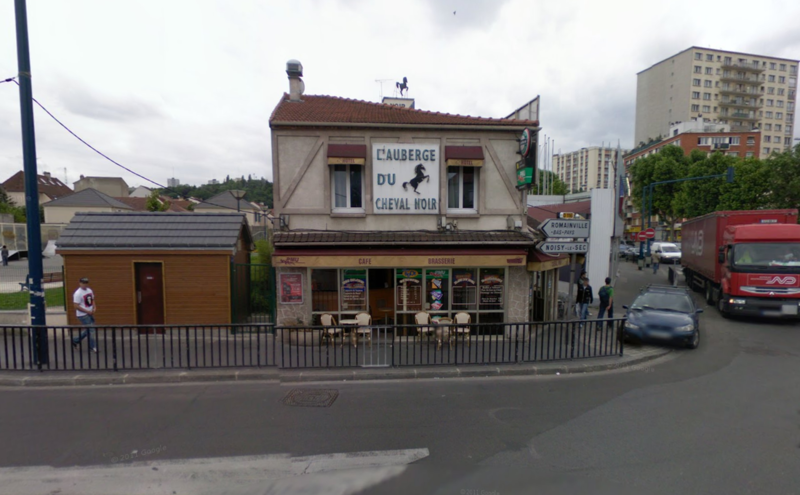 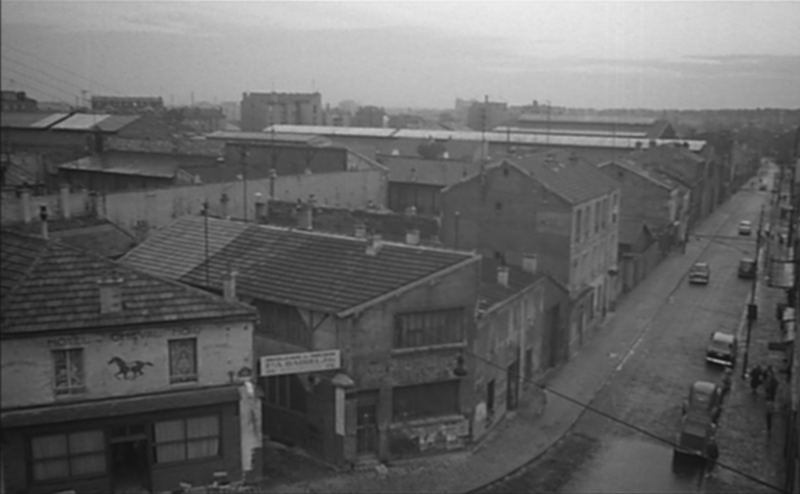 The 'hôtel du Cheval Noir' to the left seems to match 'L'Auberge du Cheval Noir', right, at the Carrefour des Limites in Pantin. 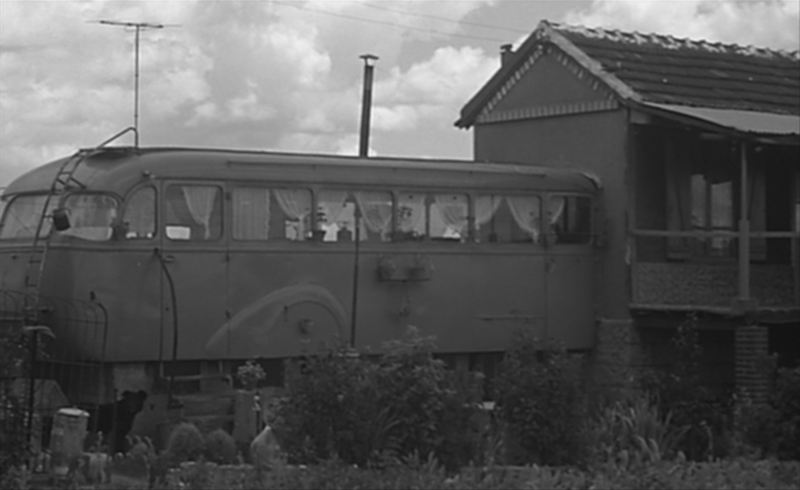 The extra accommodation confected out of an old coach reinforces the individualistic ideal but introduces a note of shabbiness. 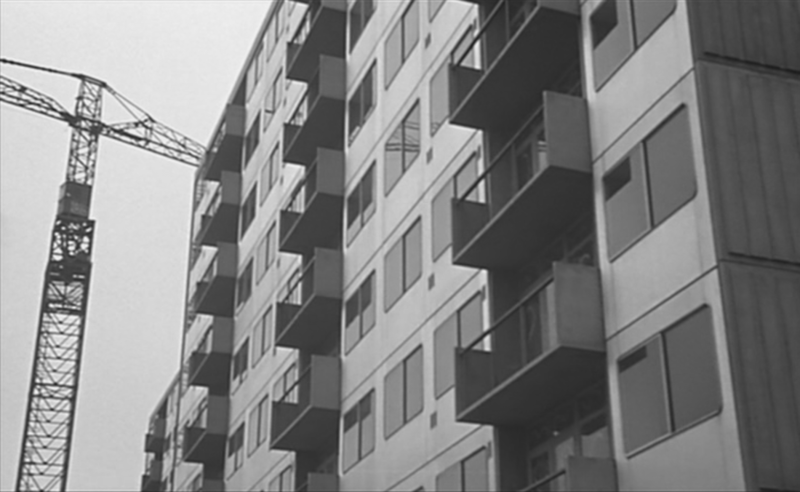 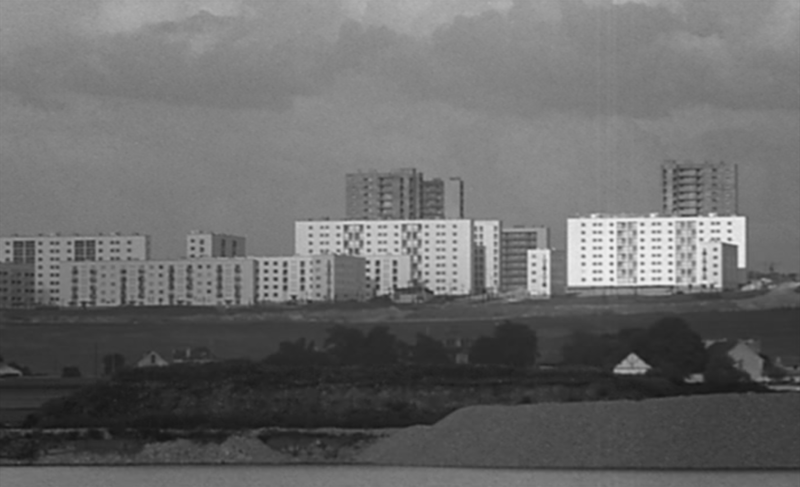 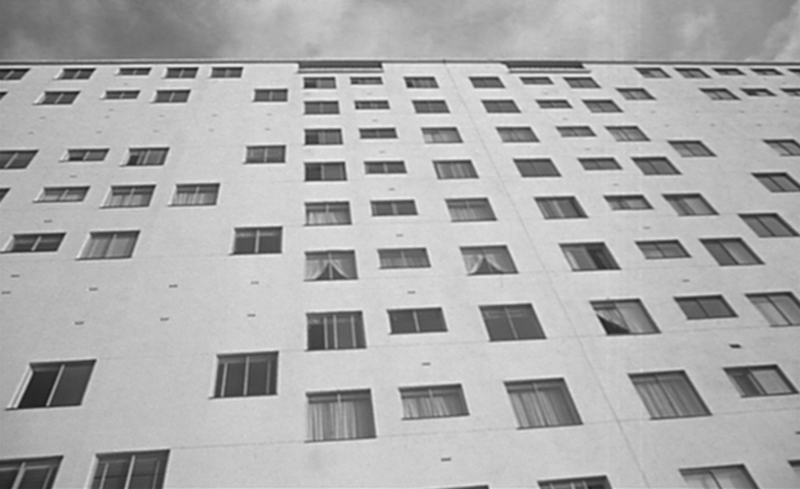 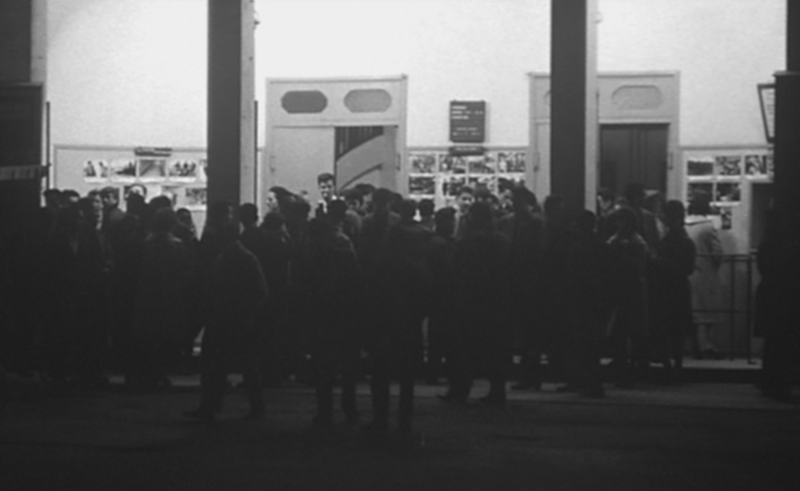 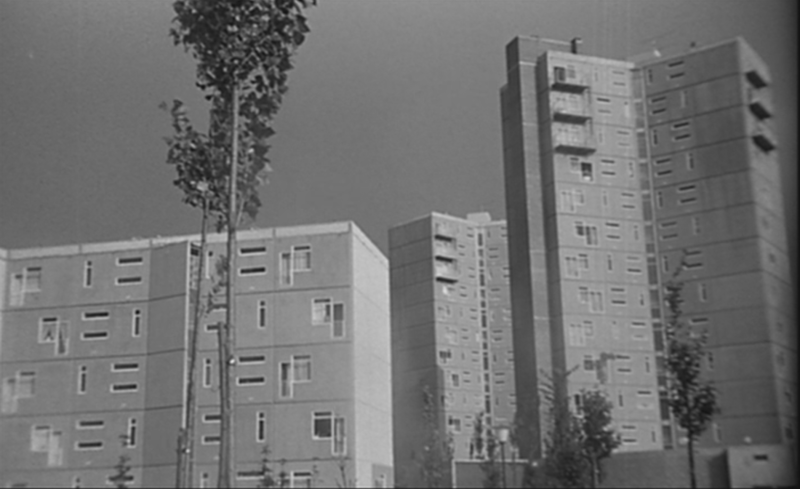 3/ social housing - H.L.M. 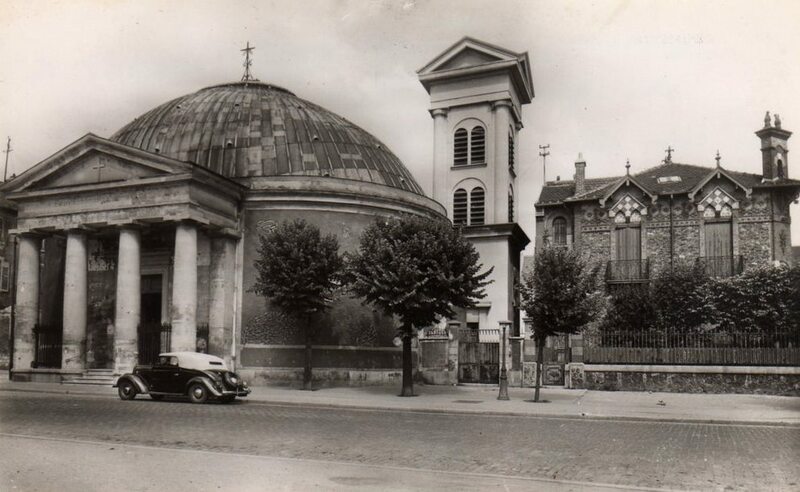 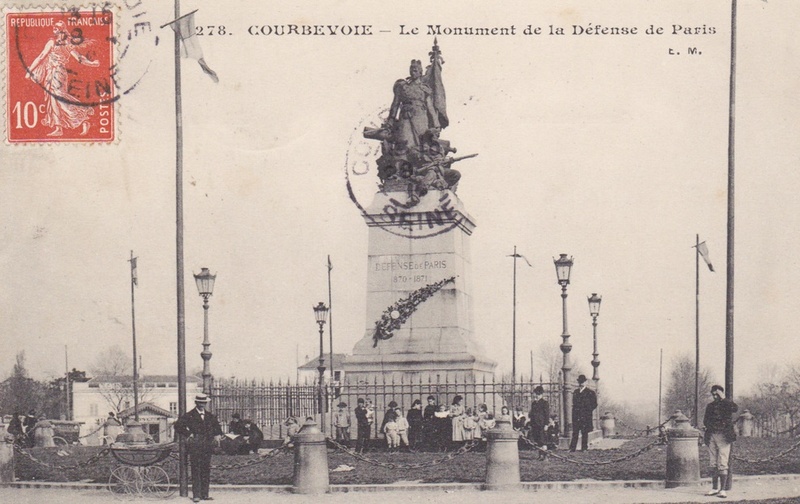 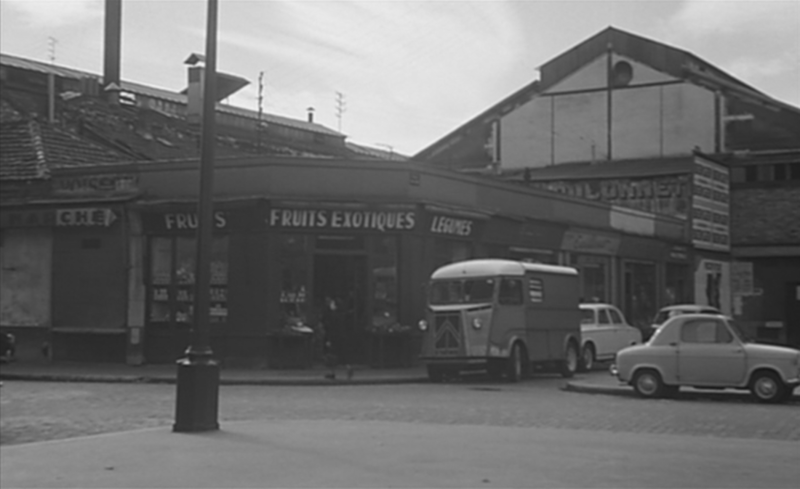 This same location had featured the year before in Gilles Grangier's Archimède le Clochard - see here for illustrations. 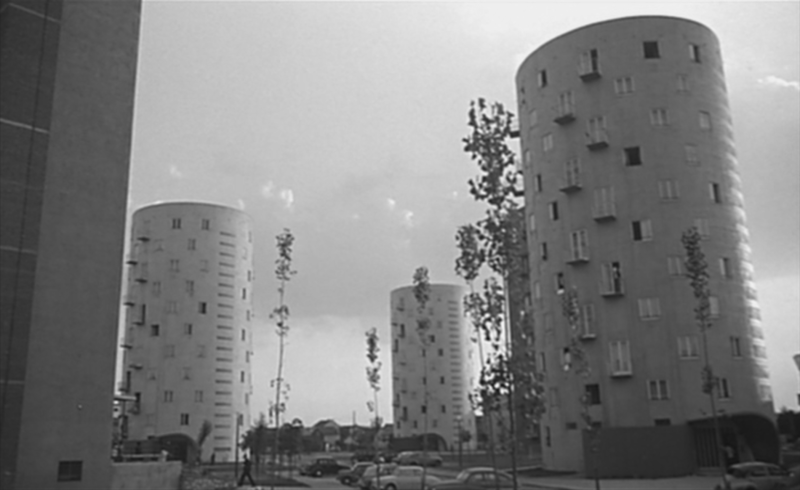 This, the Elysée 2 estate at La Celle Saint Cloud, is high-class not social housing. 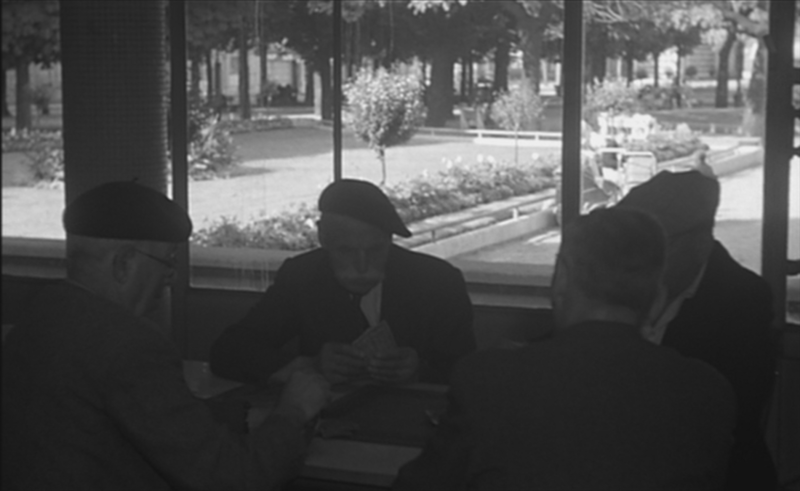 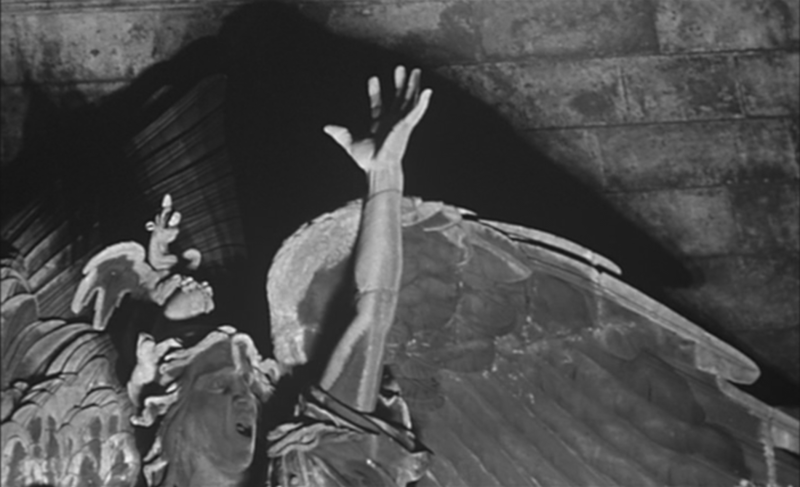 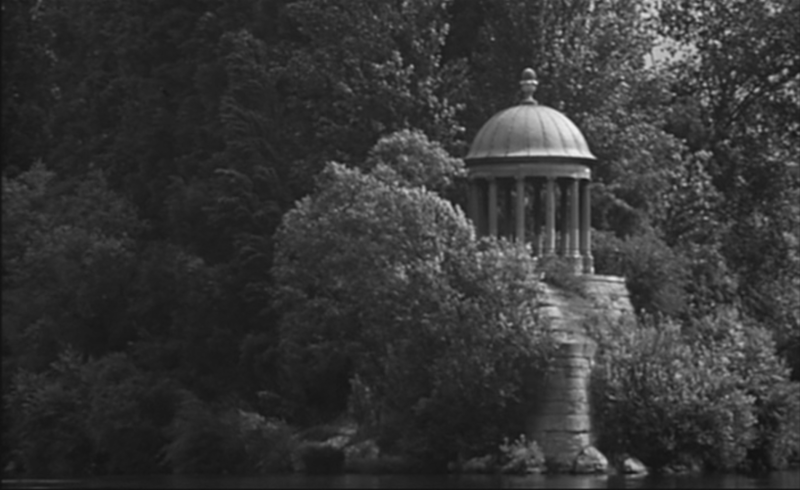 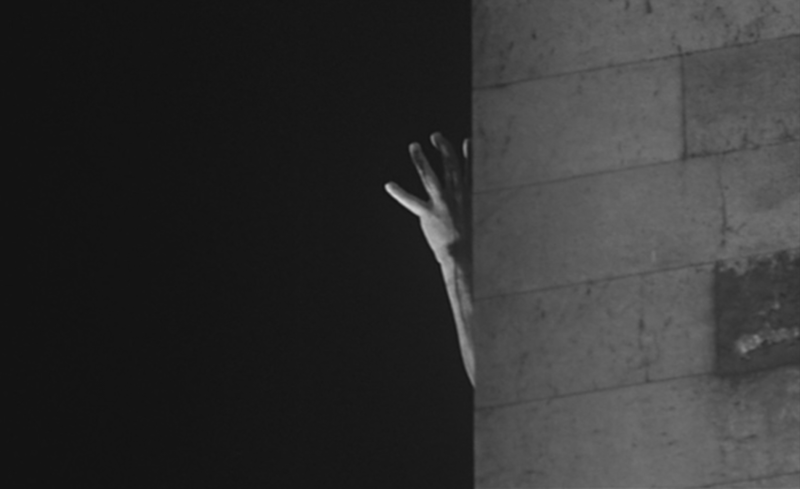 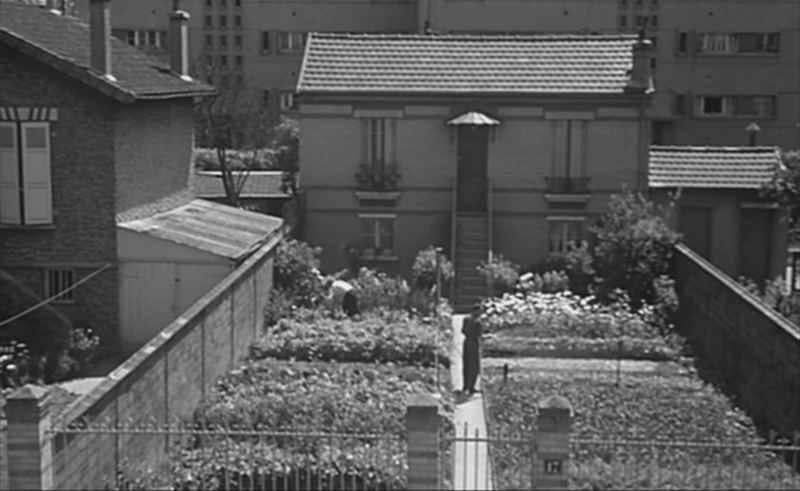 The estate was inaugurated by Jean Cocteau and Salvador Dali in 1962, and later featured in Godard's Une femme mariée​ (1964). 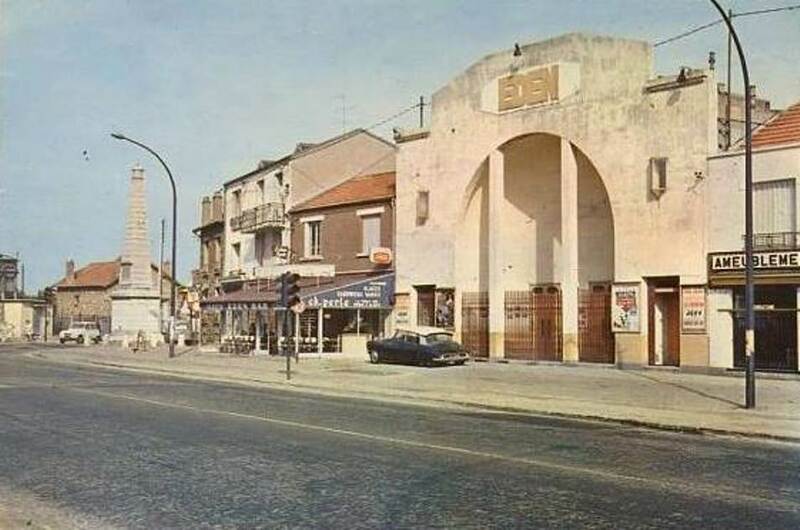 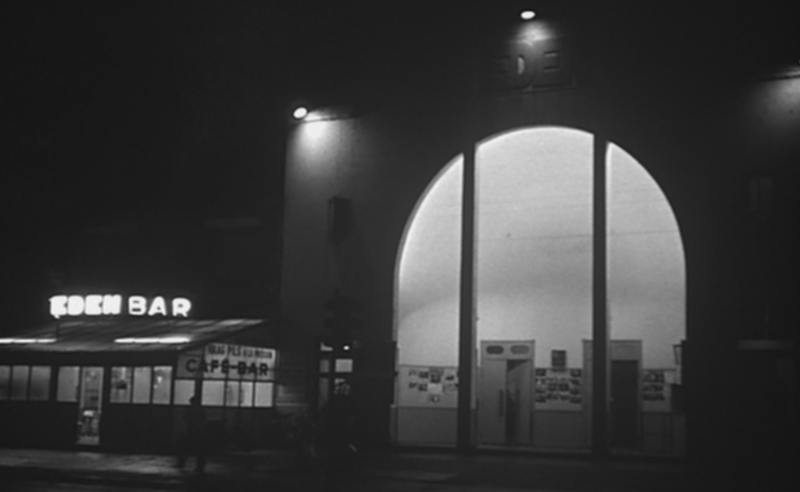 But the bus is on the boulevard Voltaire in Asnières, north west of Paris, heading out towards Argenteuil, and the cinema is the Eden at Juvisy-sur-Orge, about twenty five kilometres away, south of Paris. 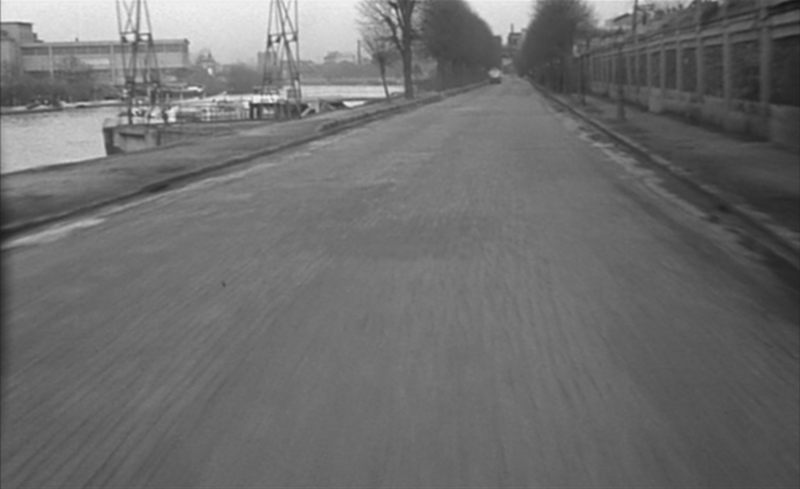 The camera approaches the fallen sign. 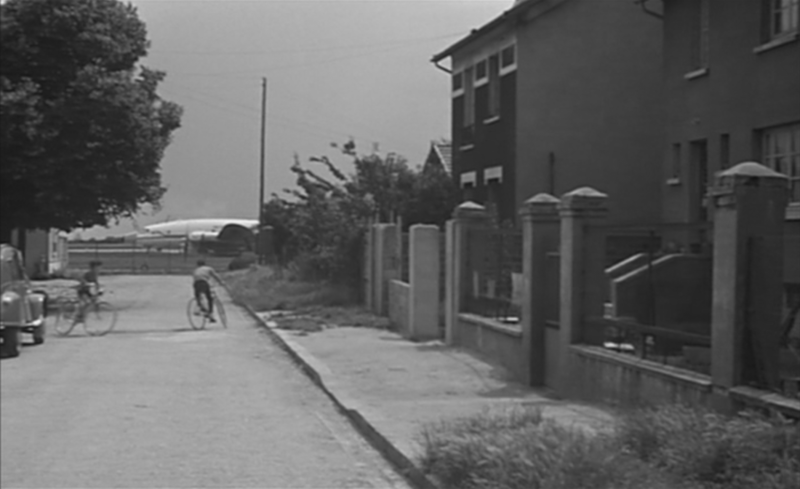 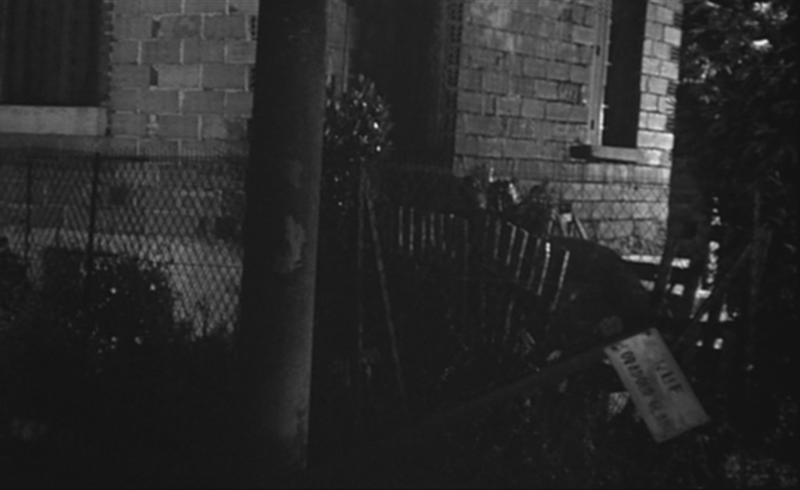 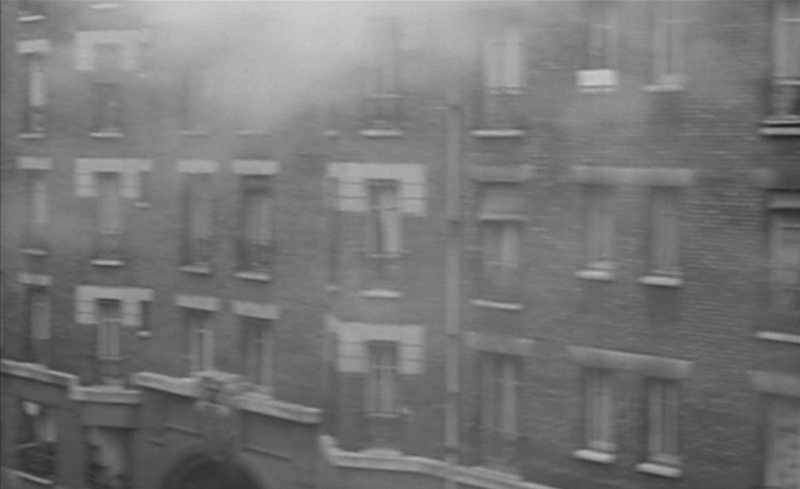 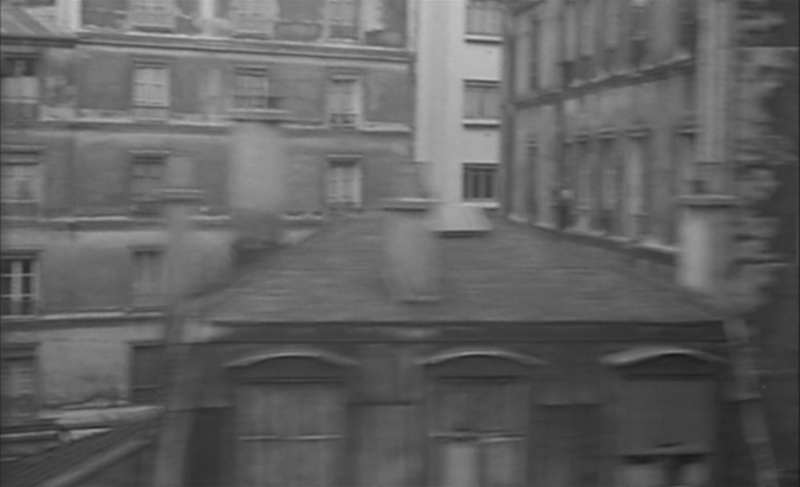 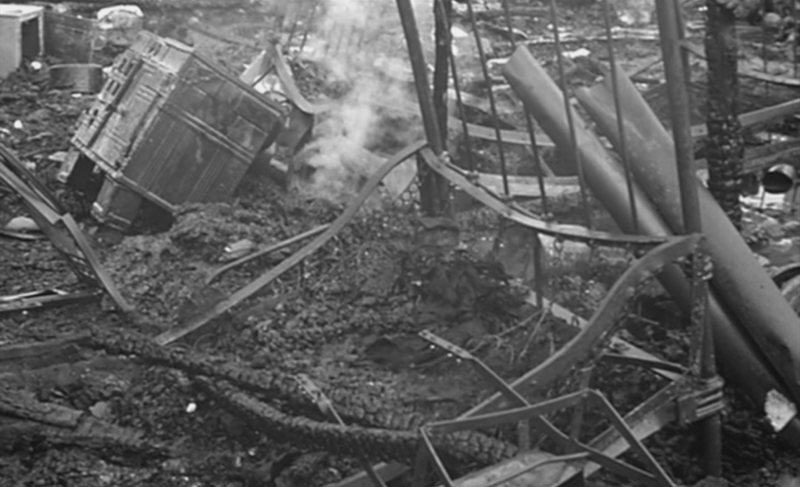 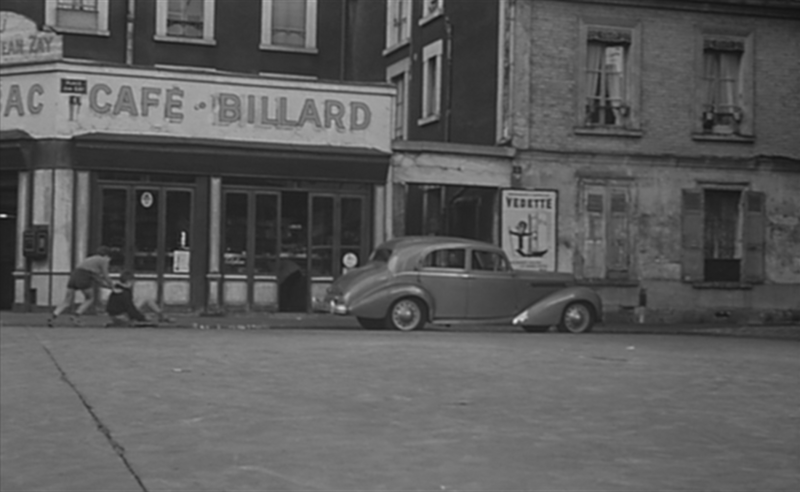 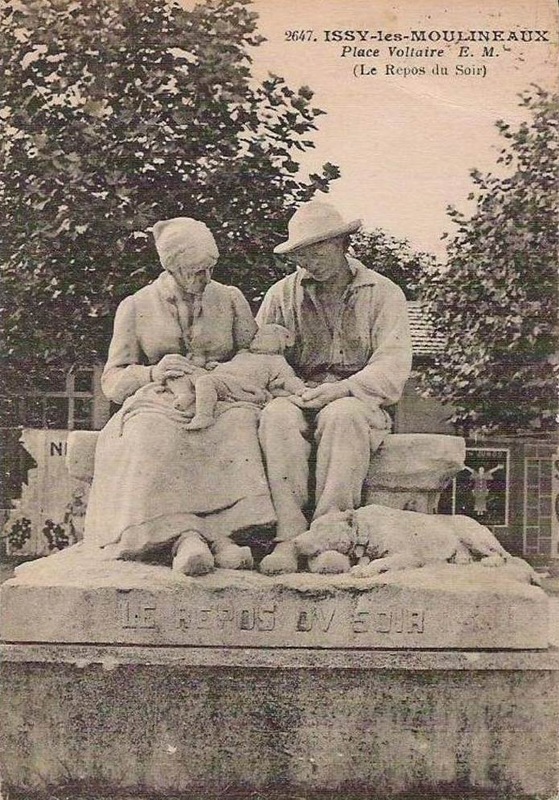 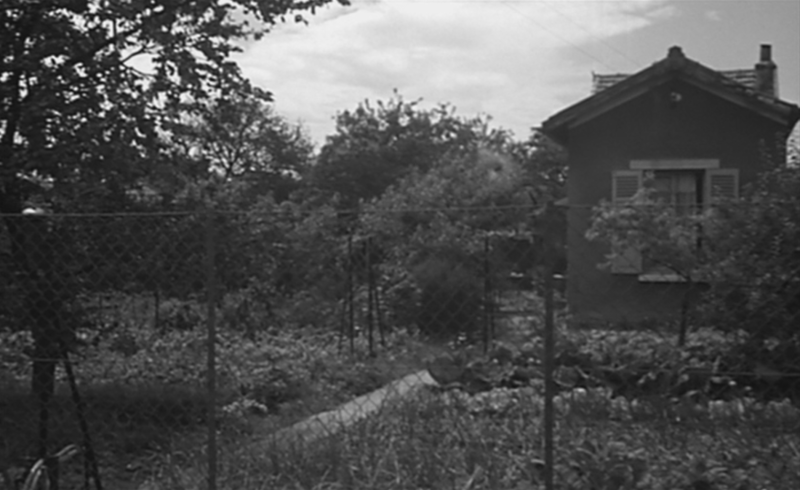 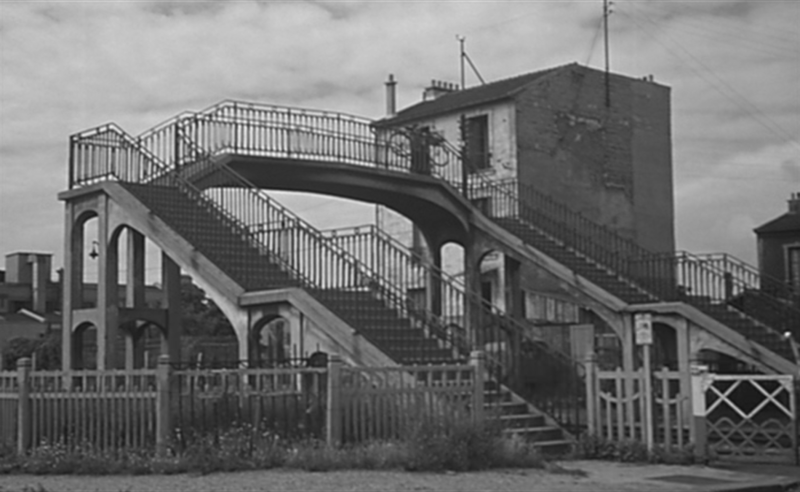 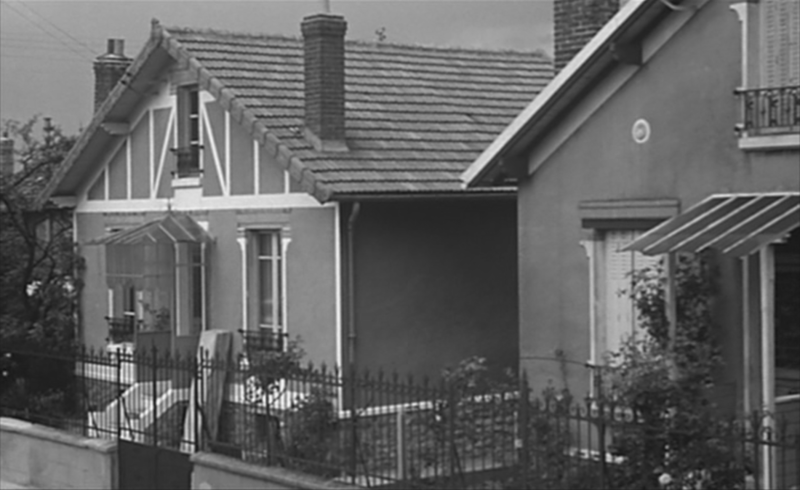 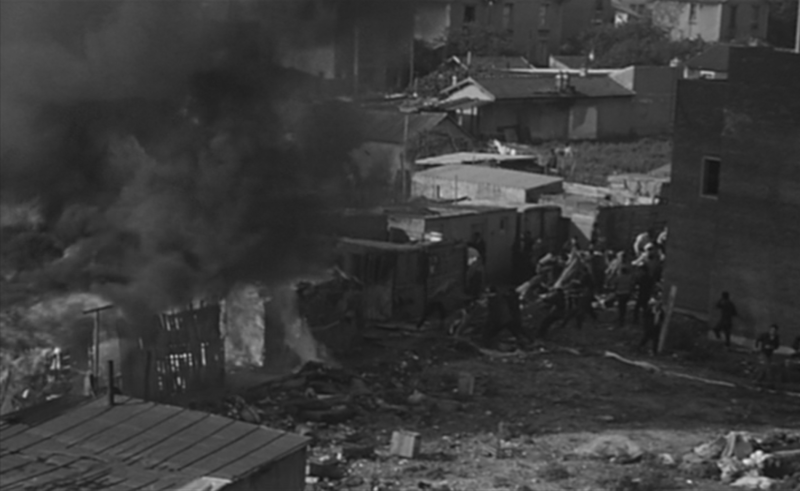 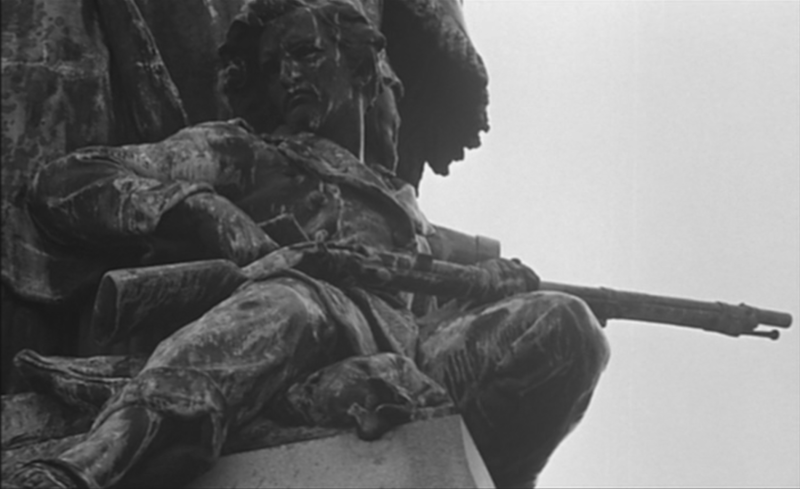 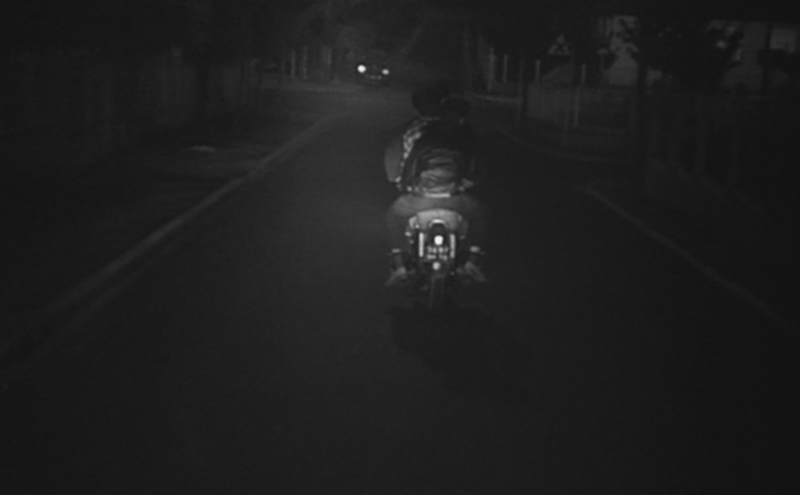 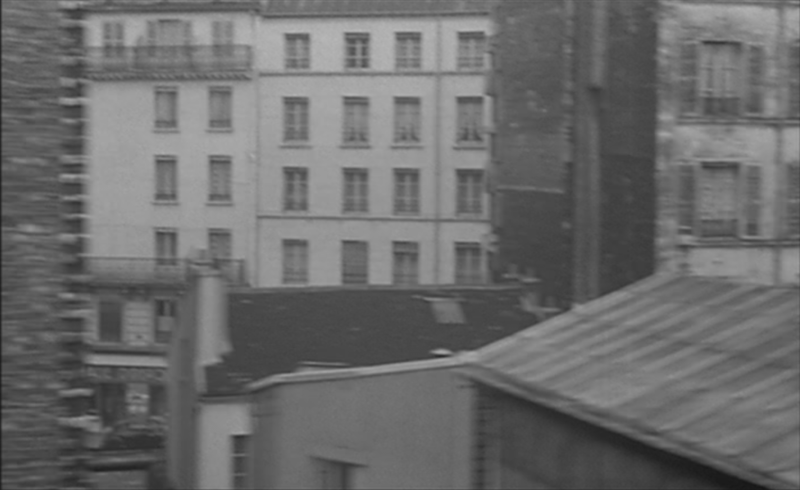 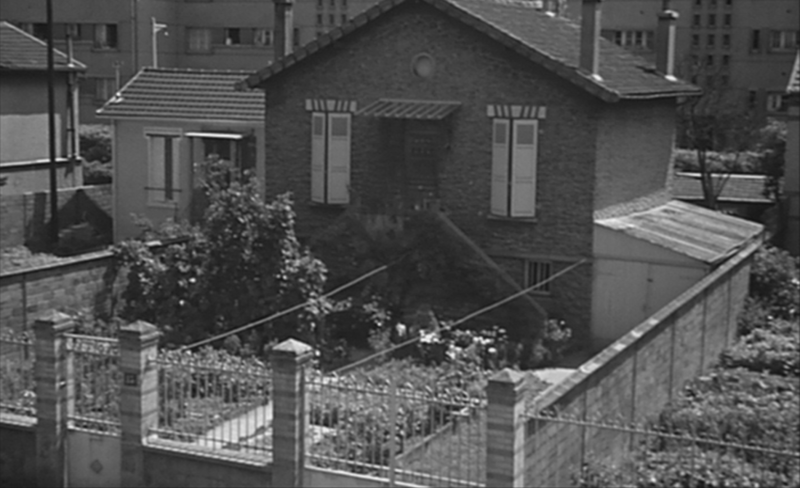 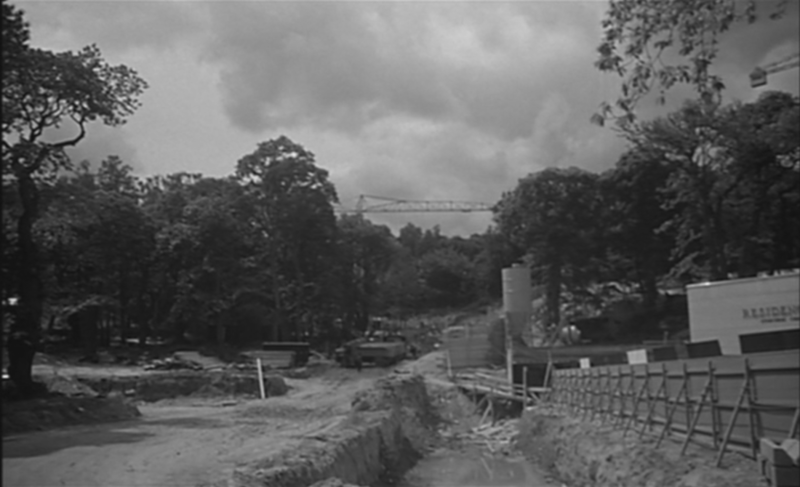 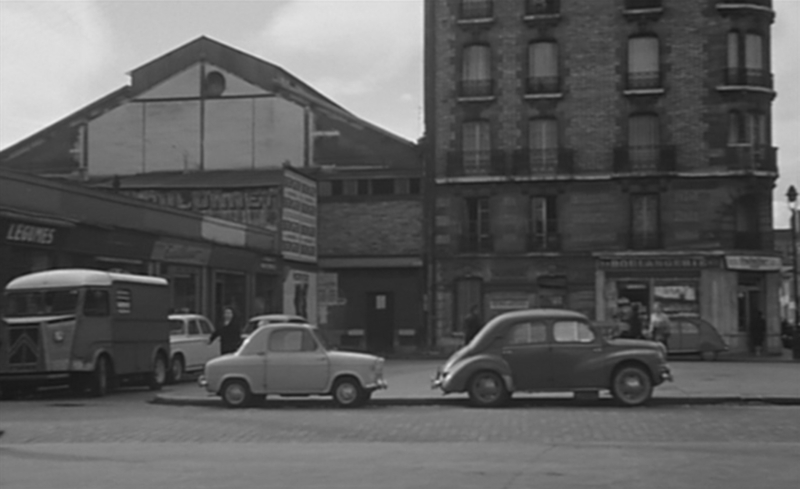 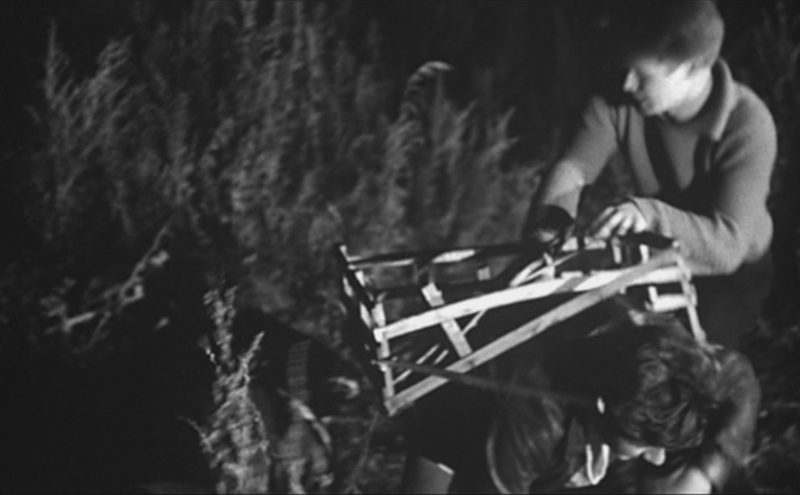 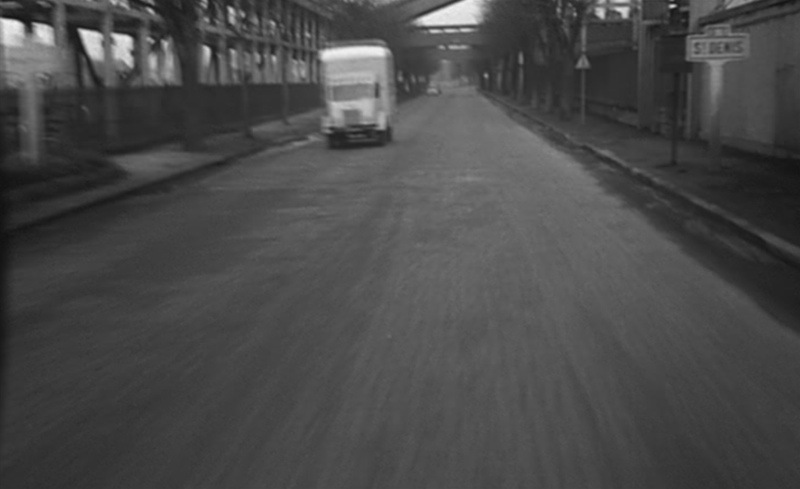 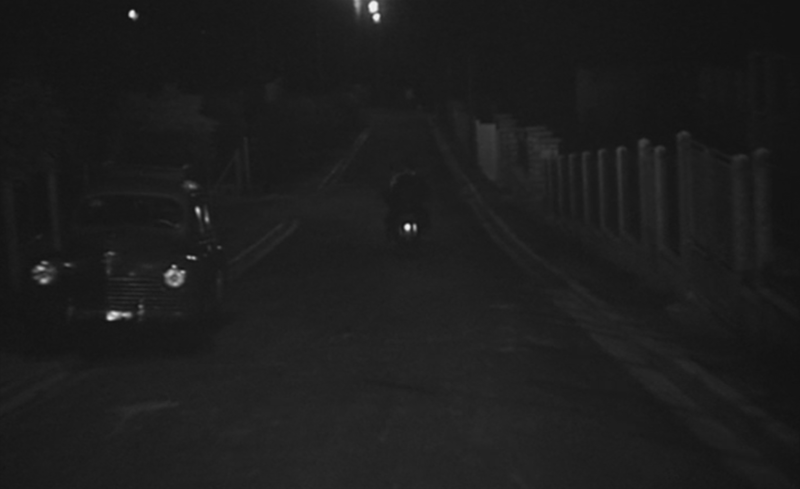 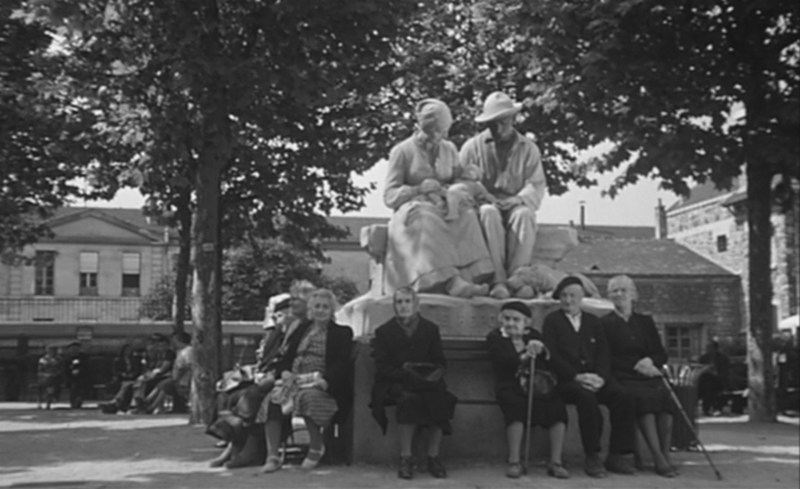 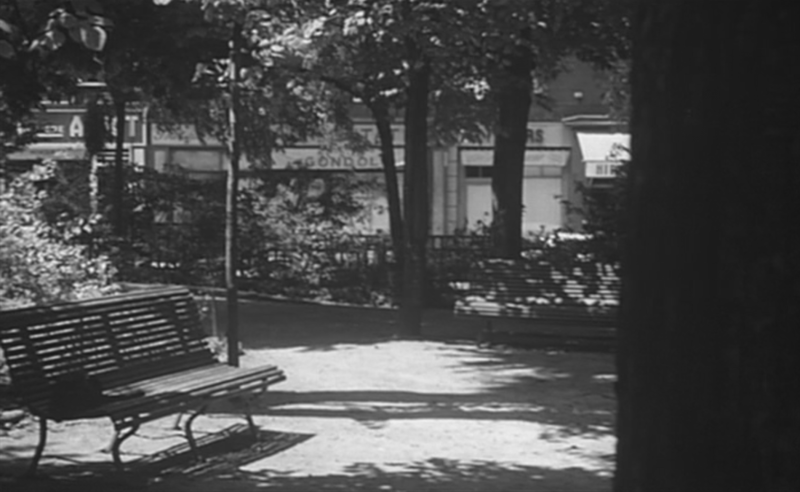 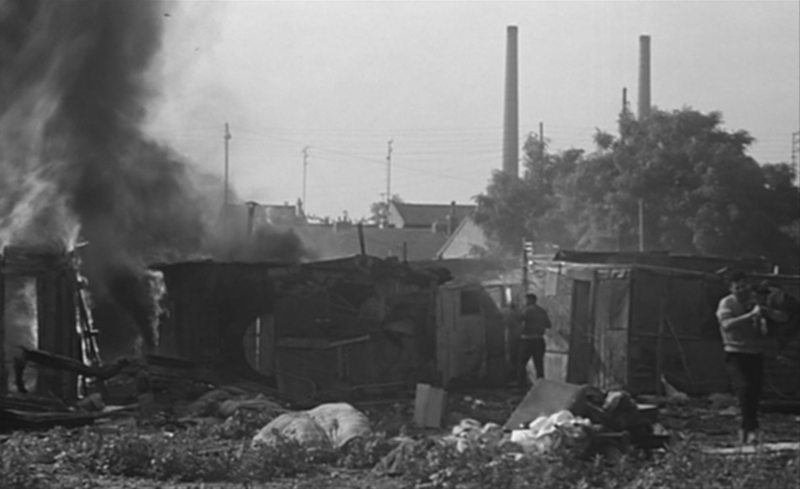 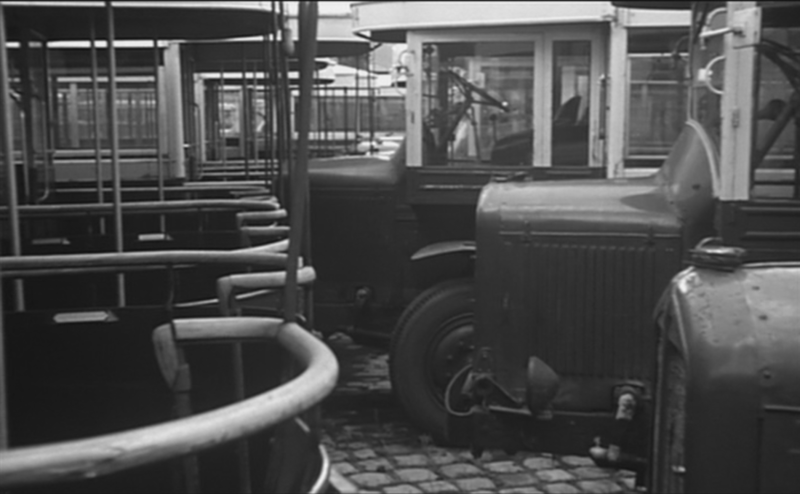 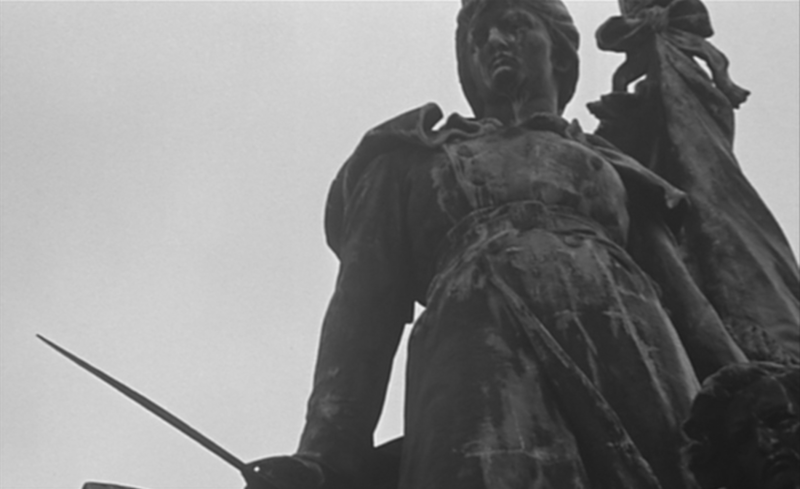 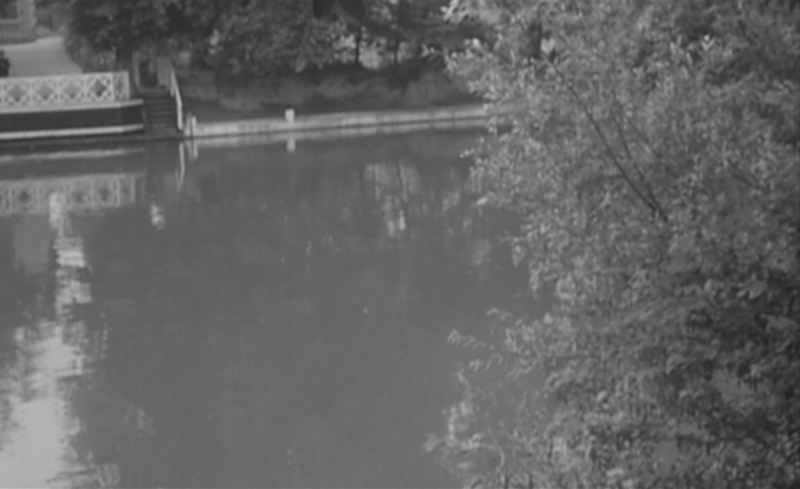 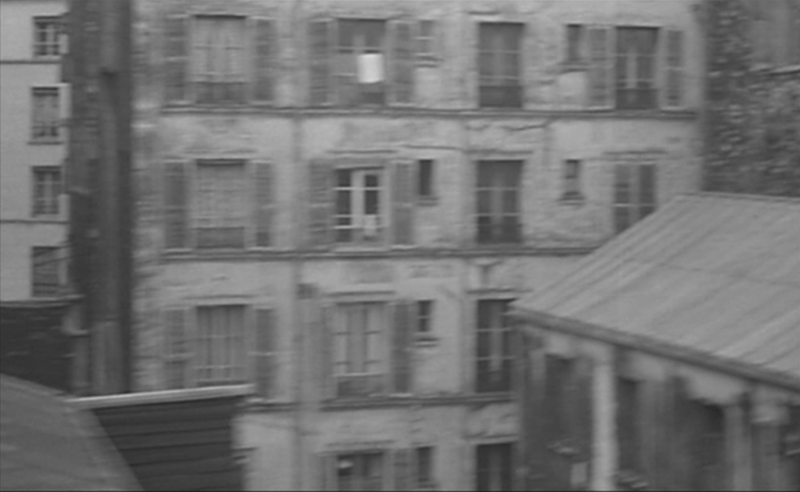 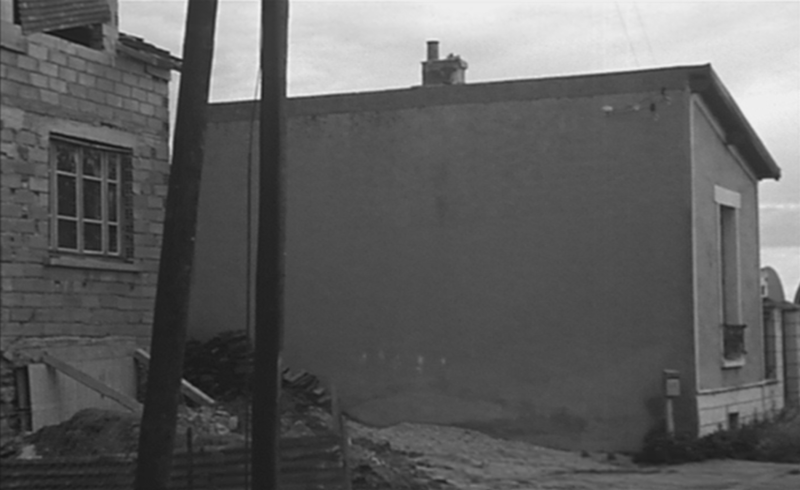 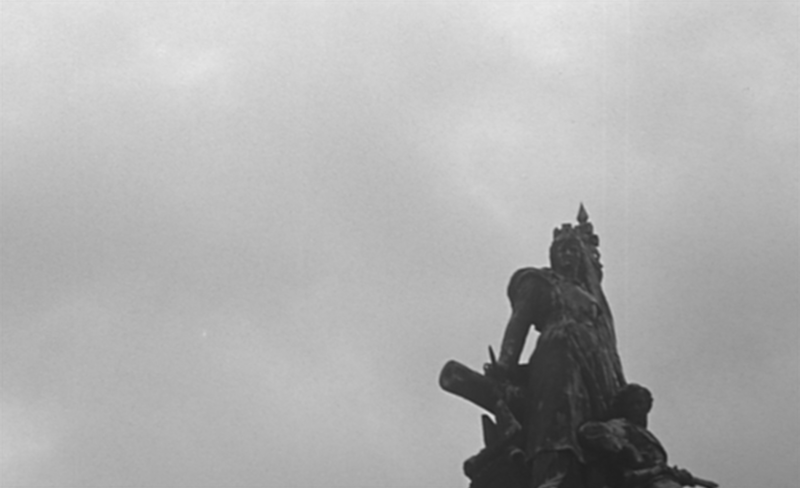 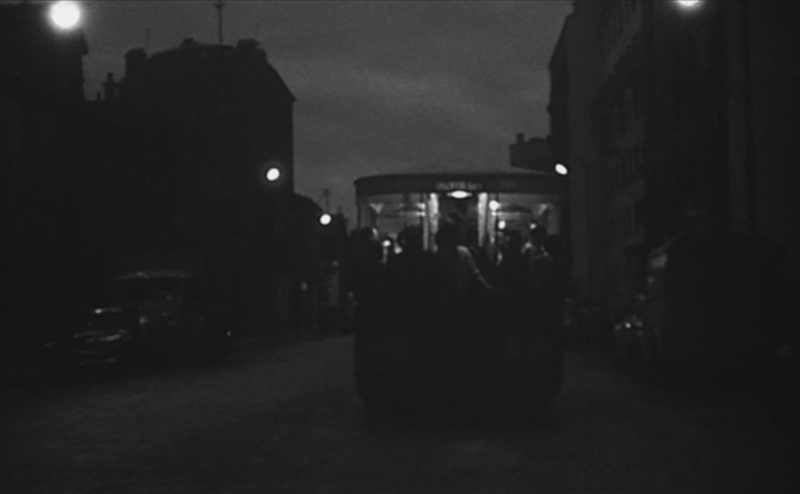 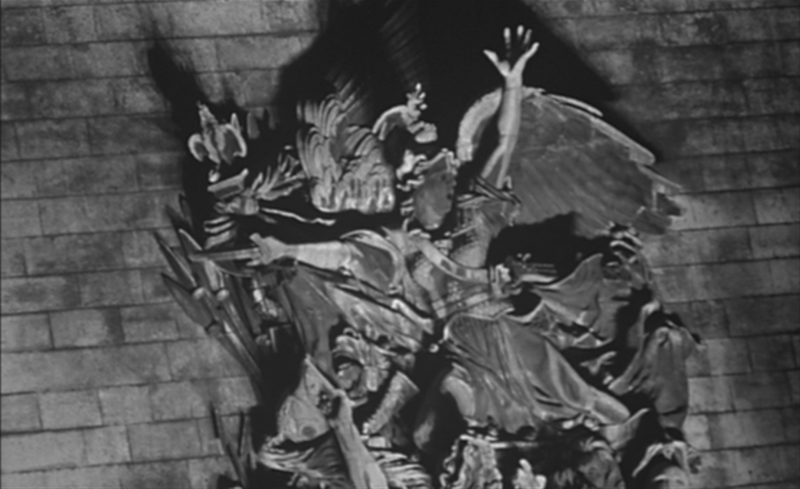 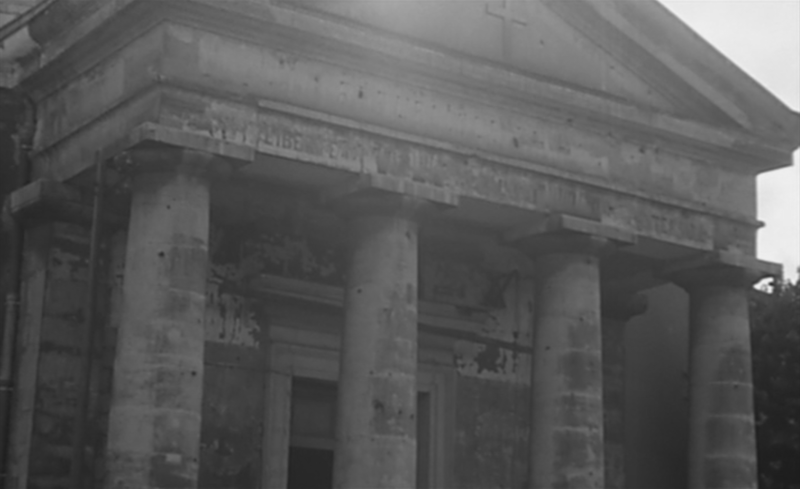 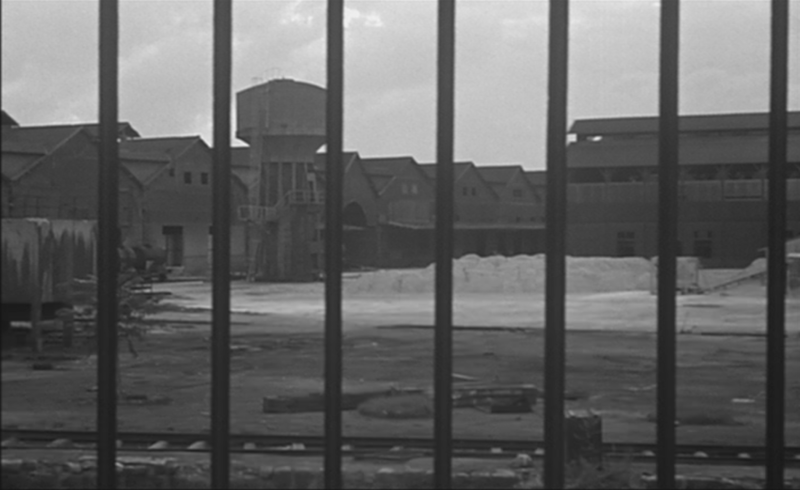 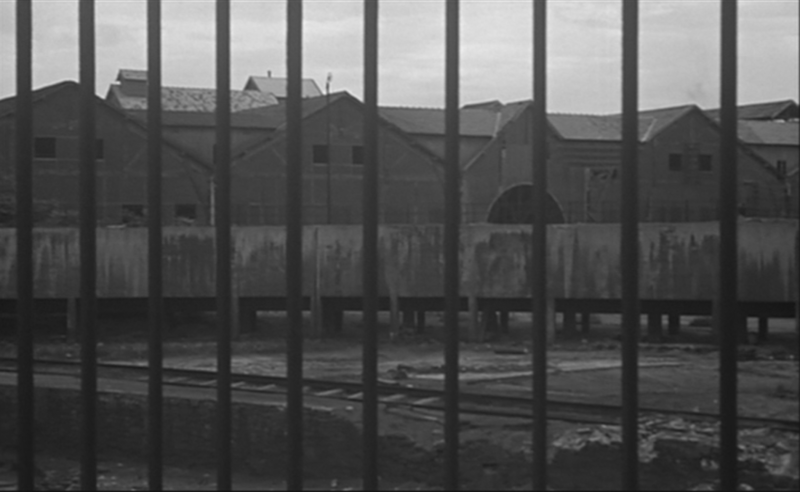 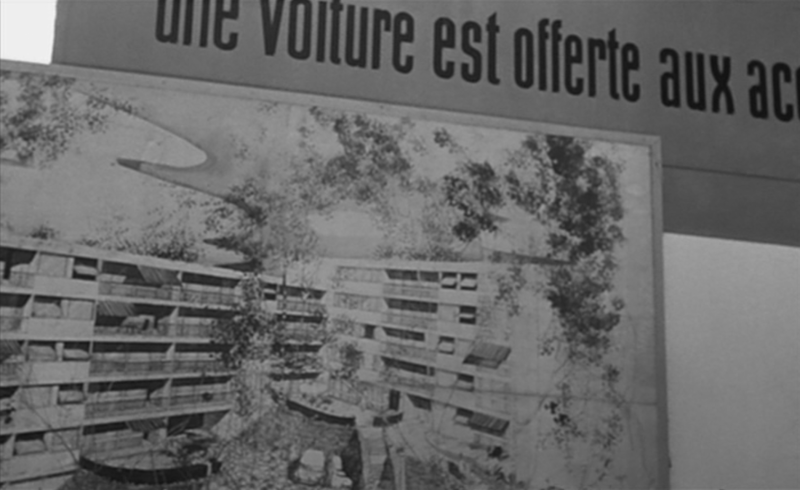 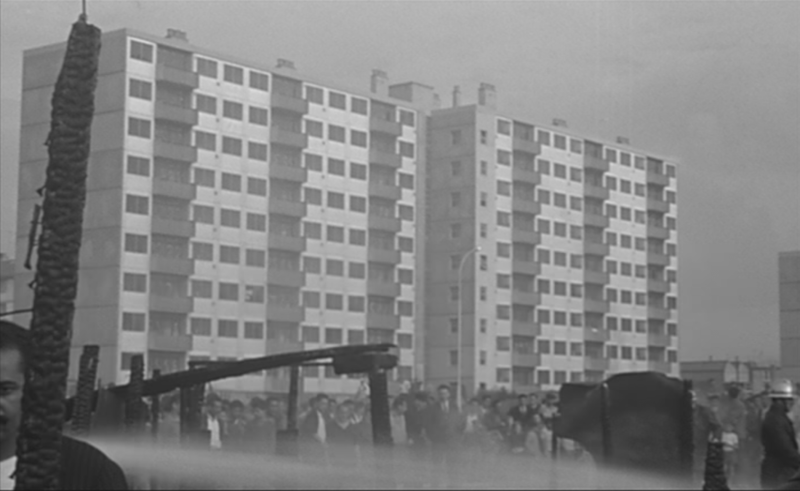 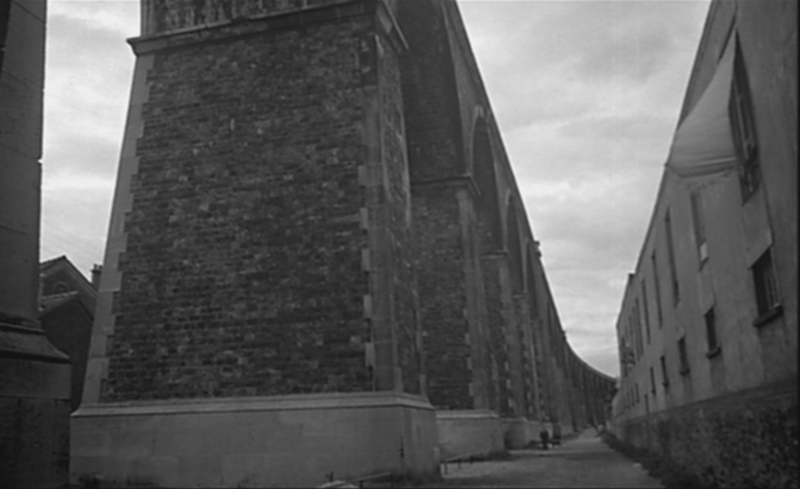 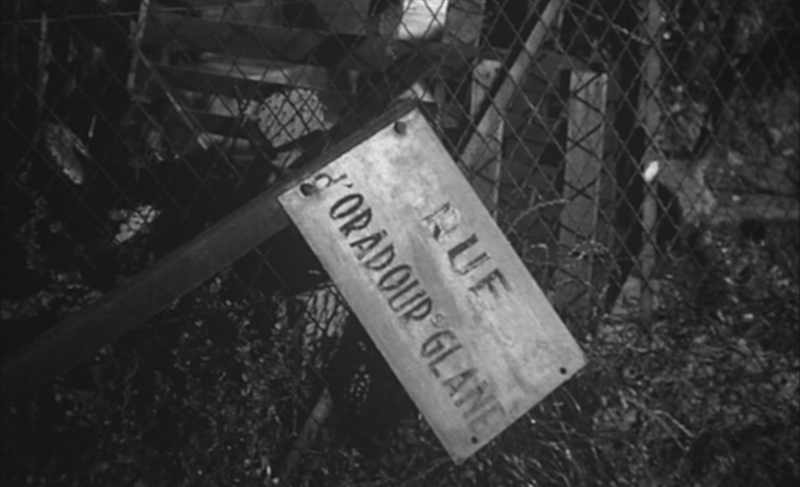 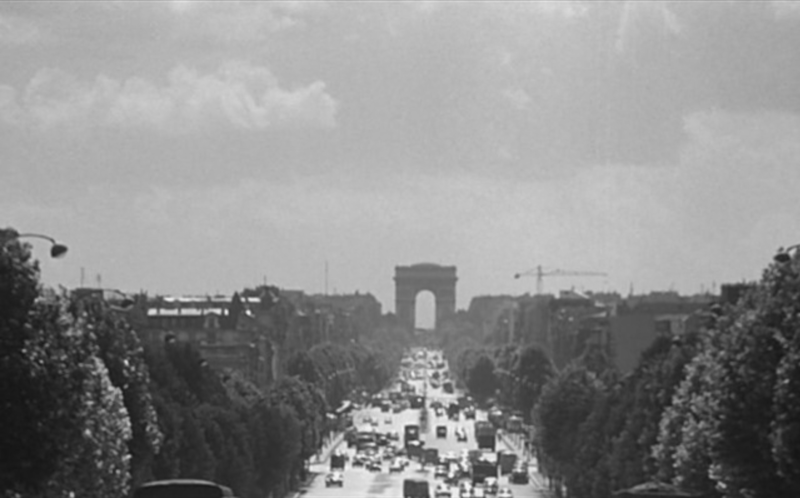 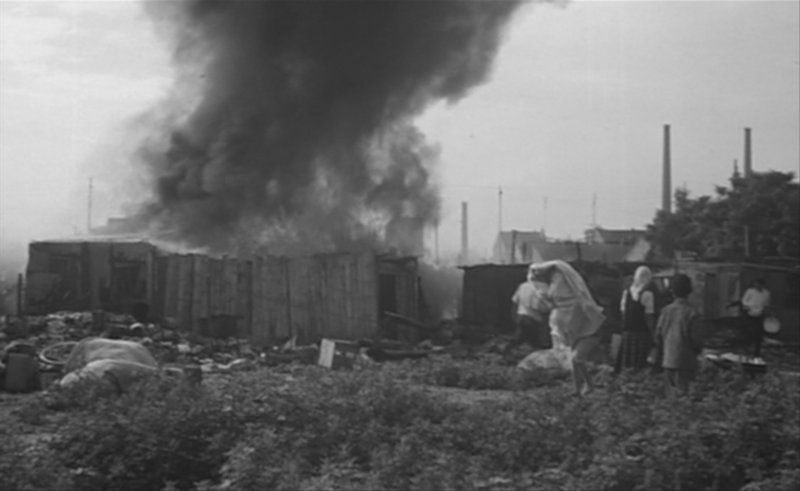 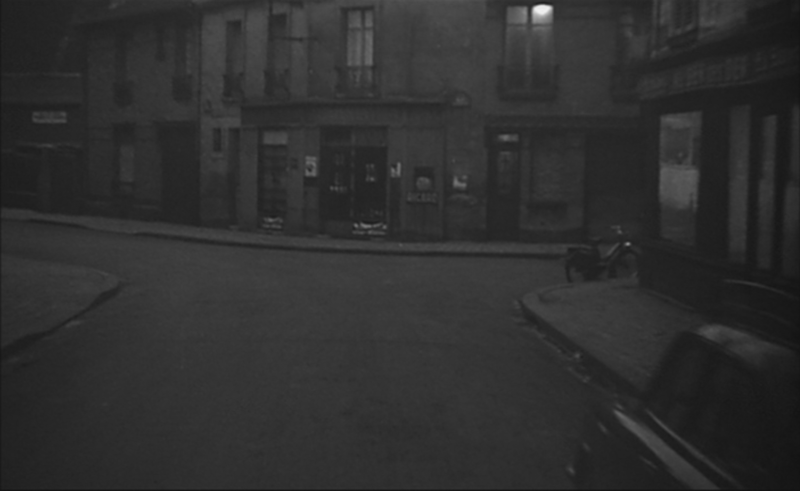 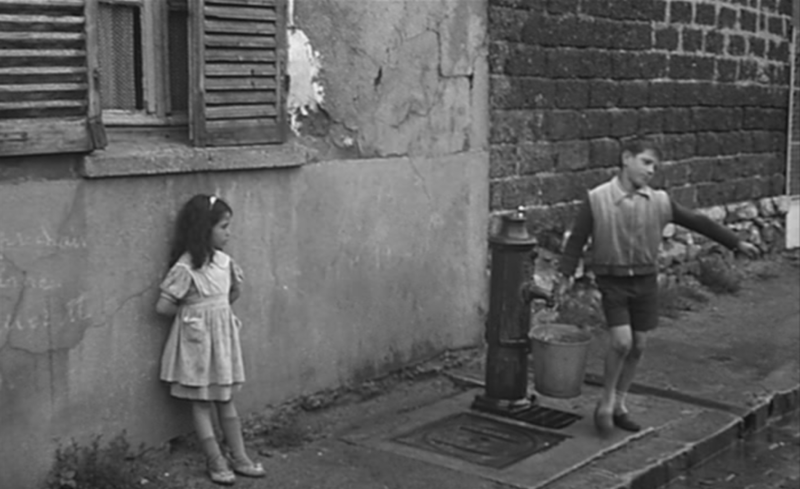 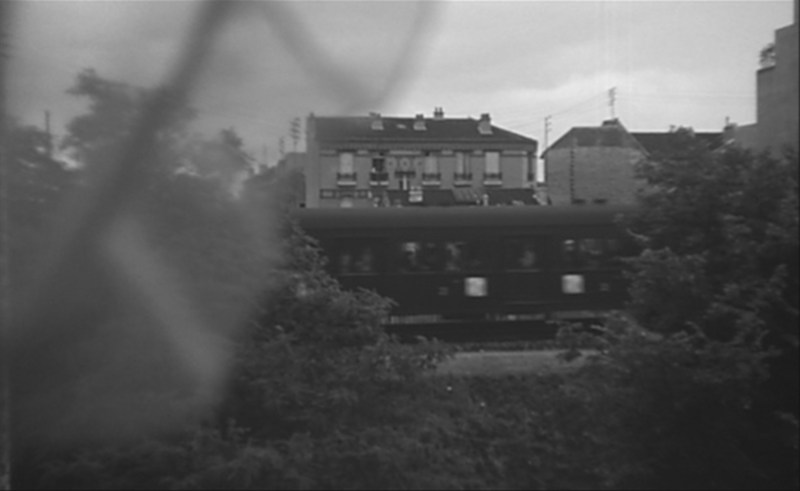 It reads 'rue d'Oradour sur Glane', and we can connect this memory of a German atrocity to the bombing of Courbevoie remembered near the beginning of the film, though it is harder to find a connection to the juvenile violence that immediately precedes this shot. 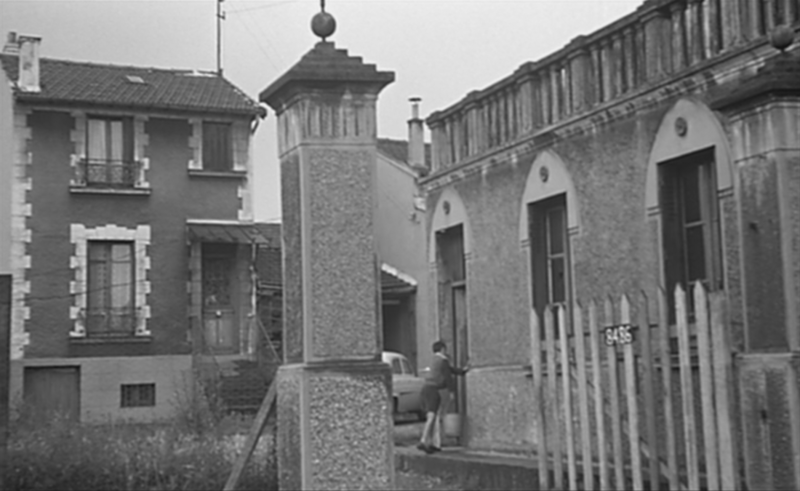 It is hard also to locate this signpost. 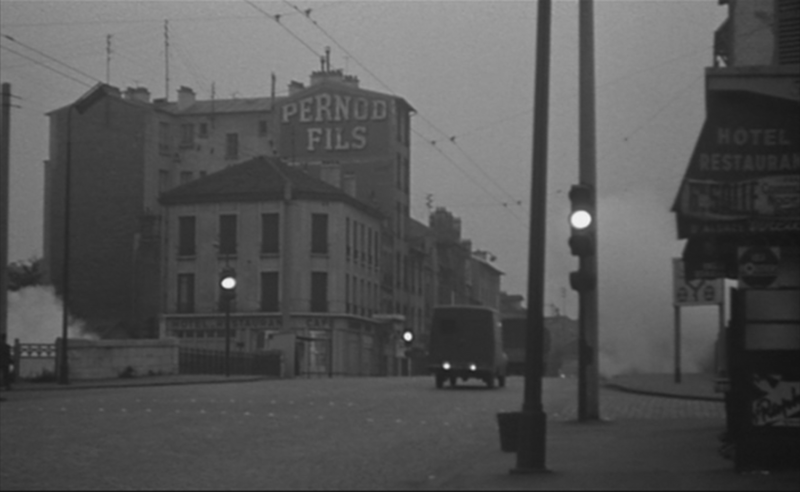 There was at the time a rue d'Oradour sur Glane in Paris, just on the frontier with Issy les Moulineaux, and another in Romainville, but neither has in it the kind of housing we can see behind the sign. 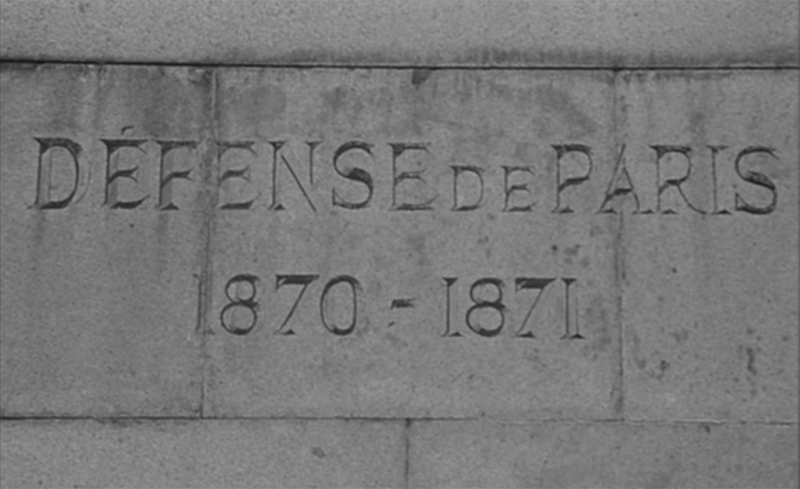 The sign itself is strange in bearing no reference to the local authority that would have put the sign up. 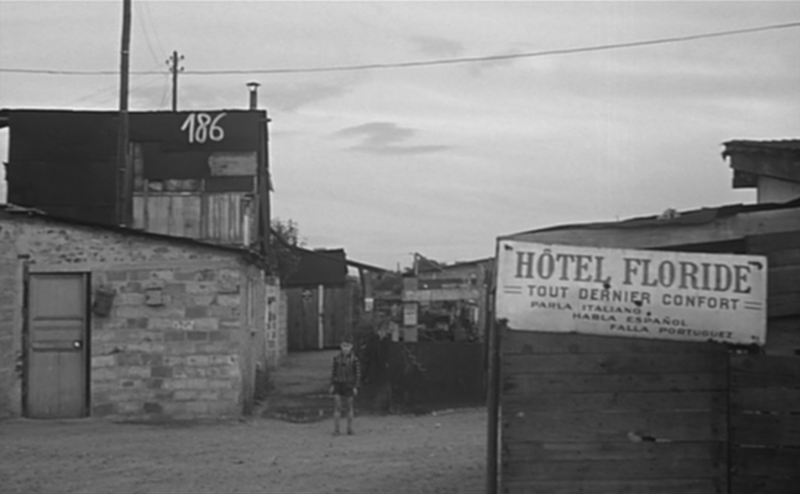 It looks almost temporary, like a street sign in a bidonville. 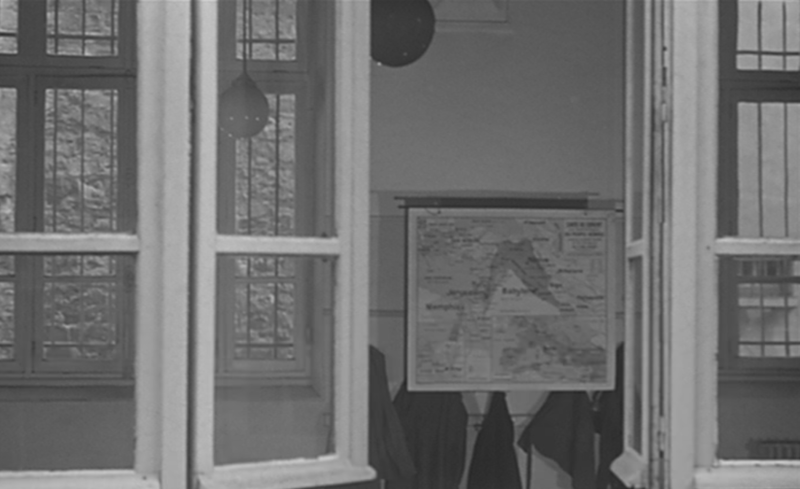 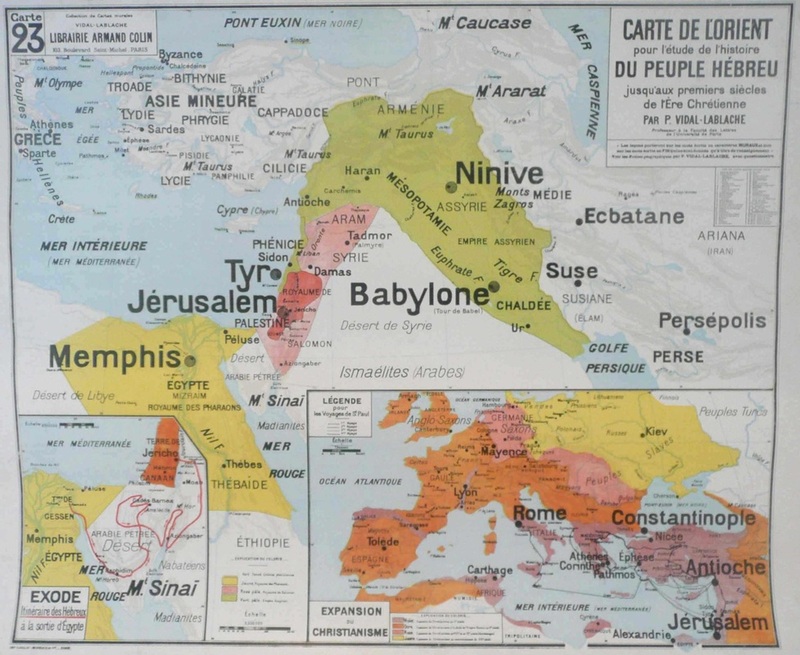 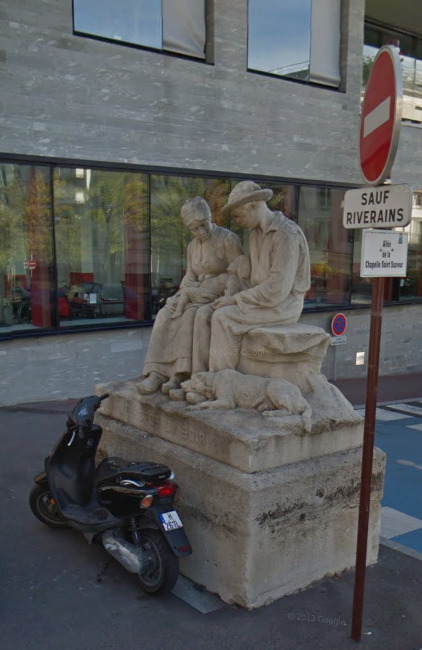 The name on the street sign is, like the map of the Biblical near east seen in a Courbevoie schoolroom, the mark of history elsewhere, a different time and place transplanted to the banlieue. 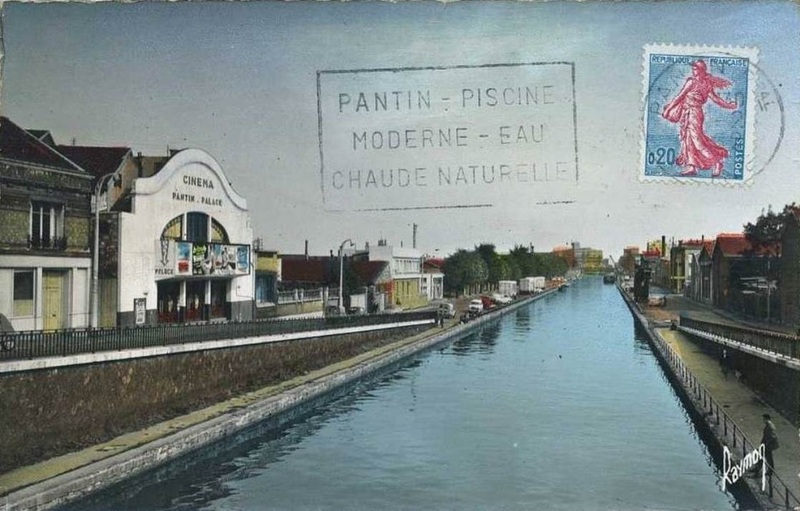 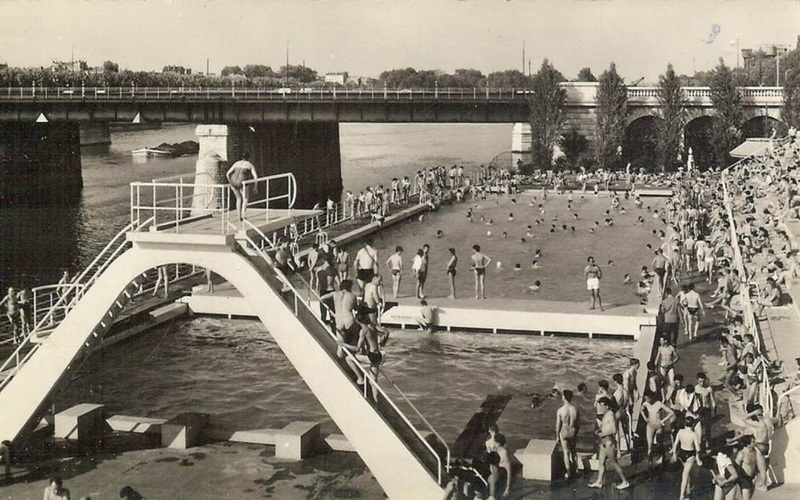 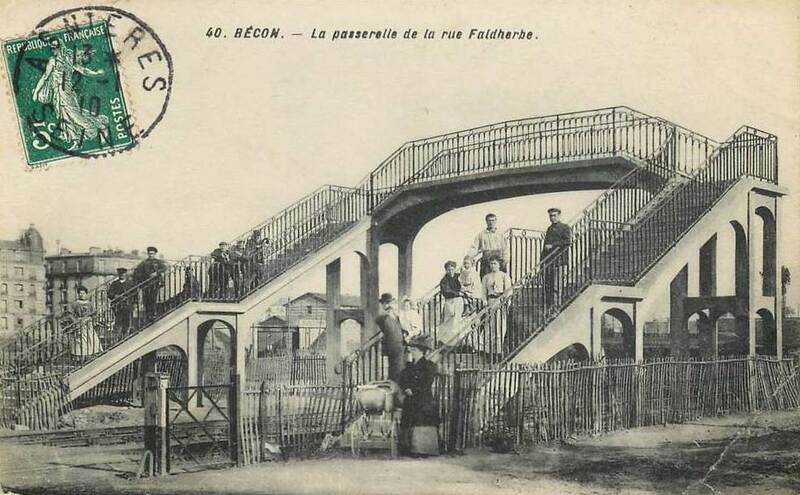 The steam rising in the right hand image was the clue that this was a bridge over railway tracks, but the specific identification came from tracing the itineraries of the four trolleybuses in operation at the time, with the help of experts at BusParisiens, a wonderful discussion forum dedicated to Parisian buses (merci FANA92 et TN4HBAR). 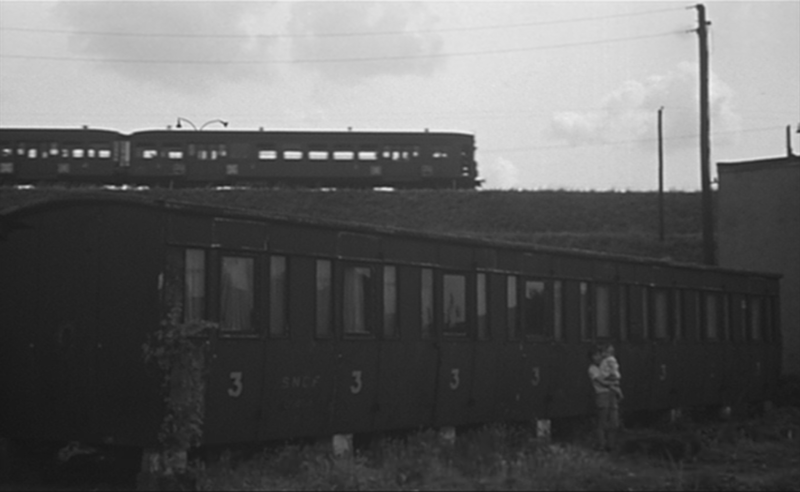 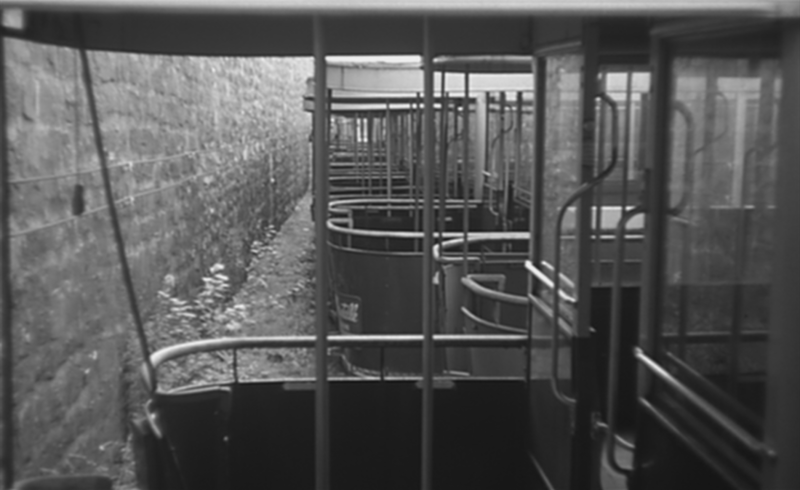 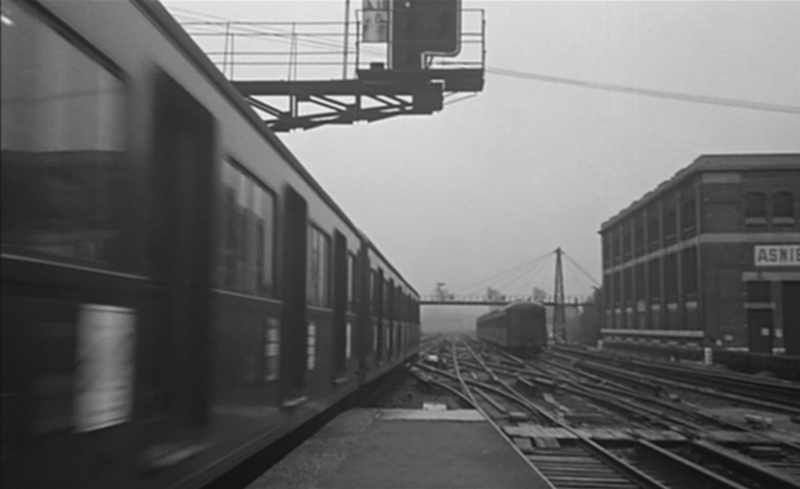 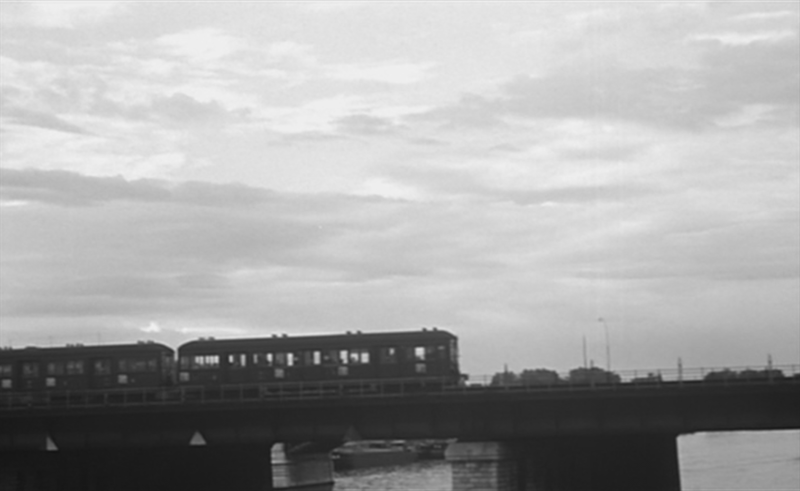 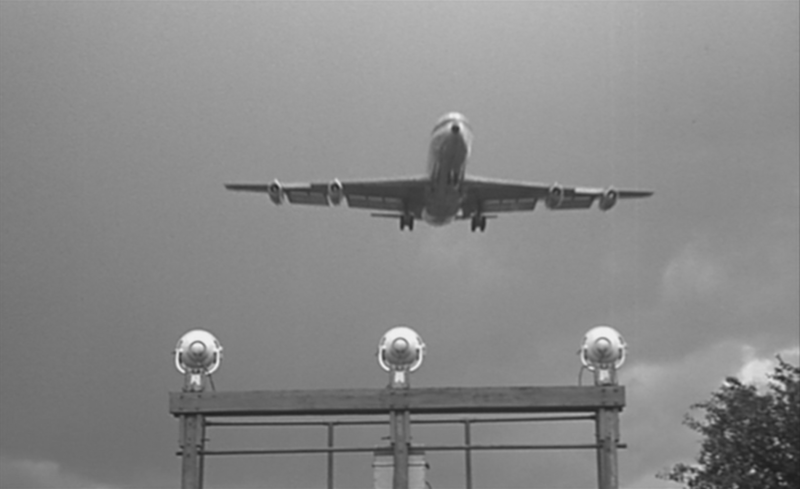 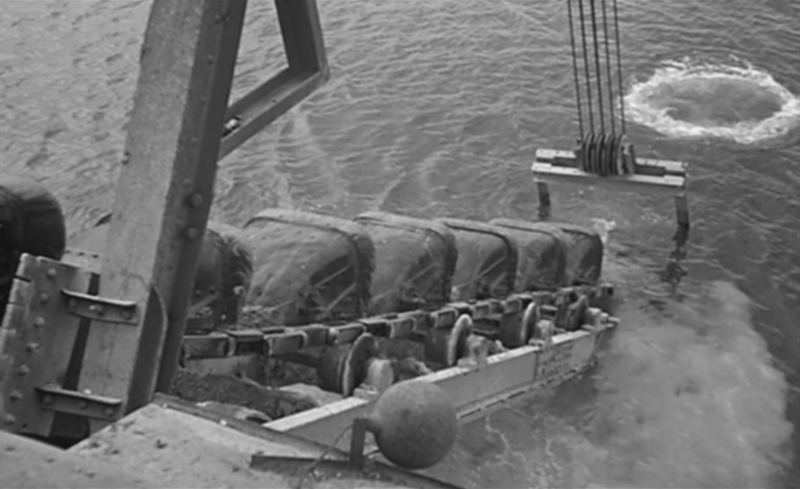 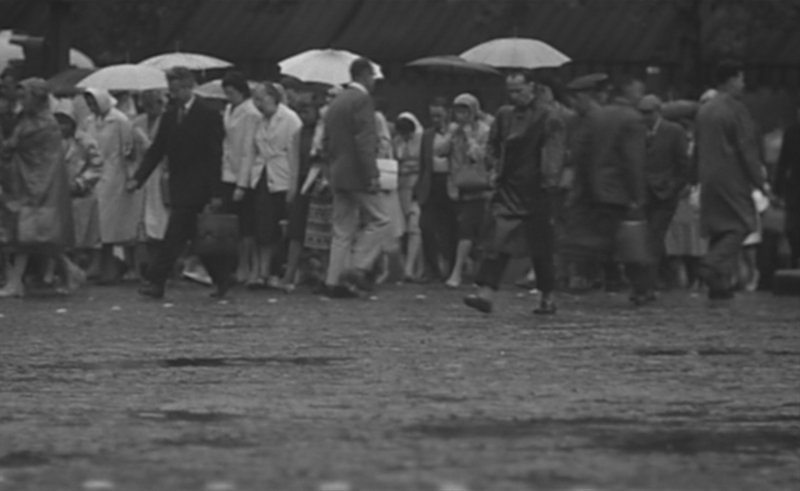 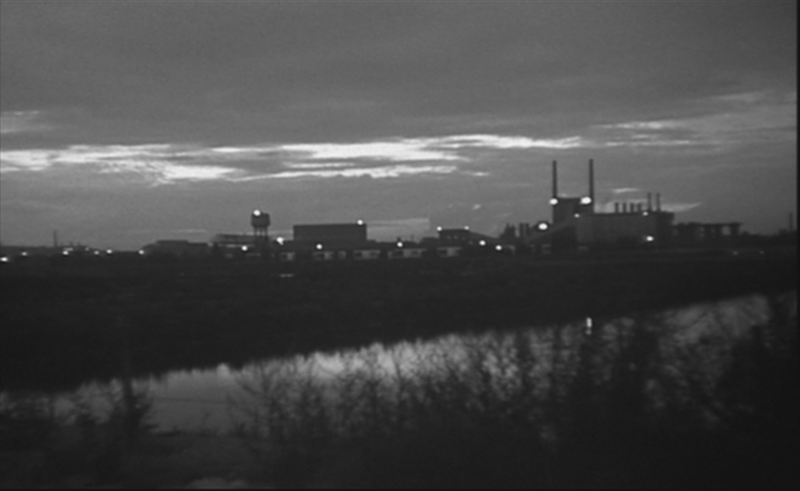 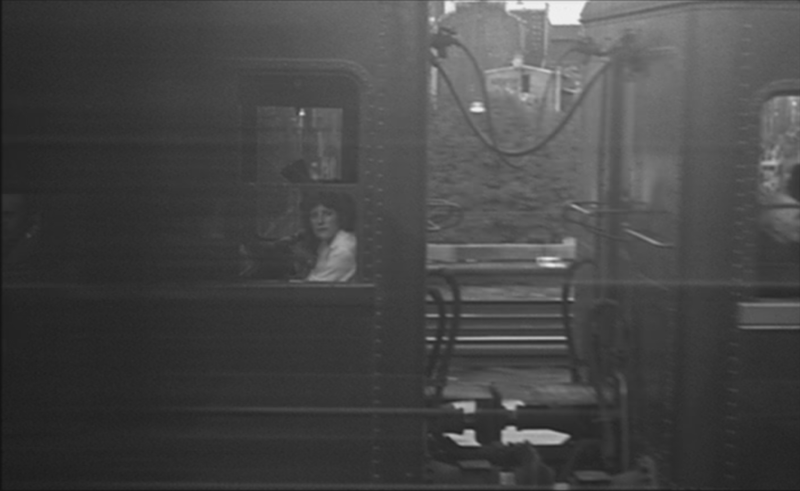 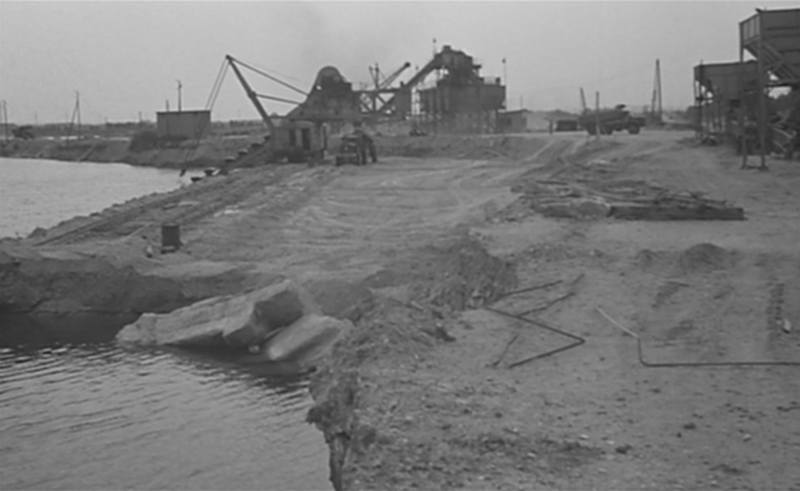 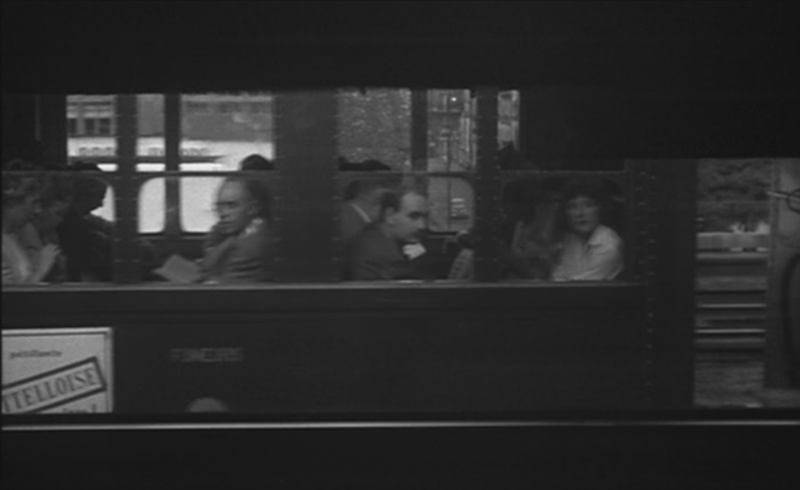 Aside from the theme of redundancy, which continues into the next sequence, these two spaces are linked by the tracks that mark the ground, evoking the railway lines that run through the whole film. 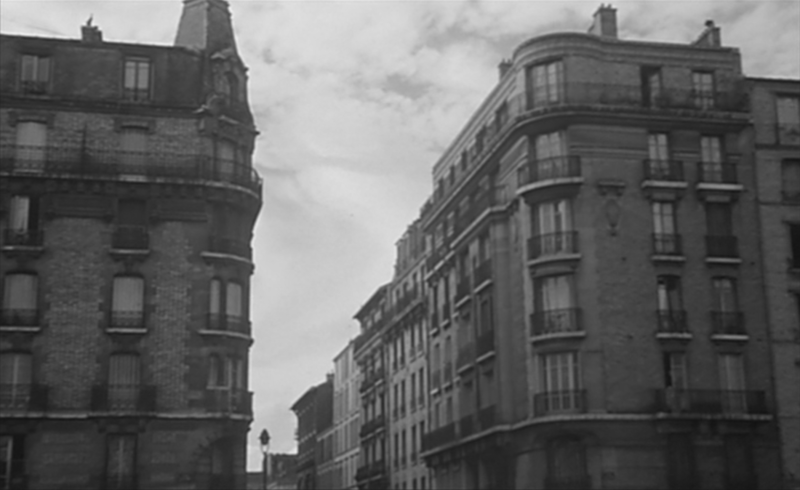 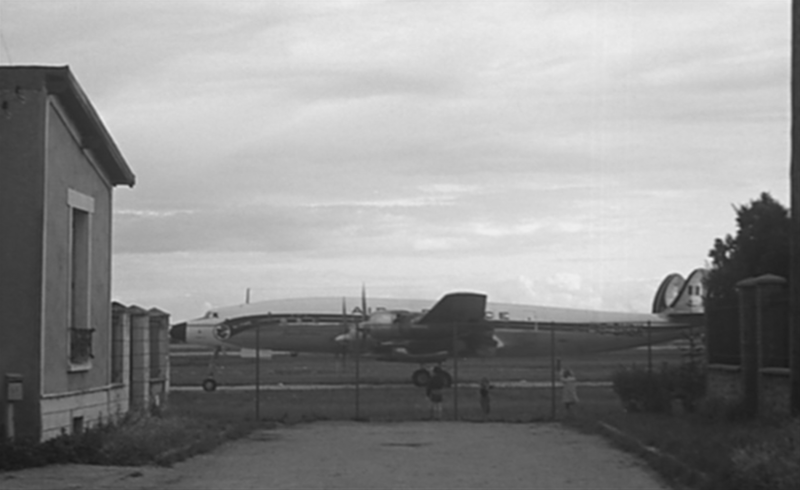 Of the thirty different locations listed here, only nine correspond to places I have been able to identify in the film. 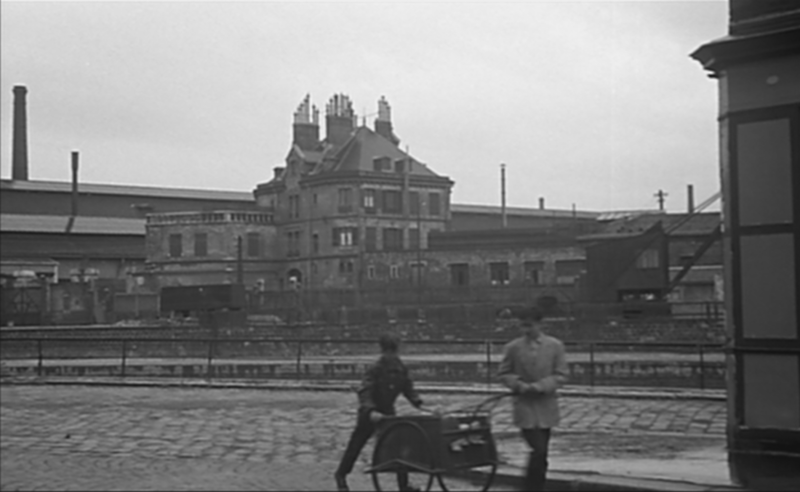 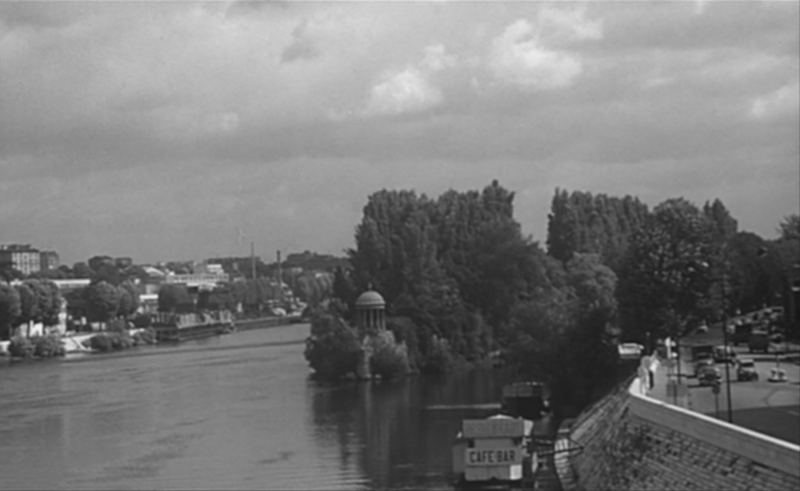 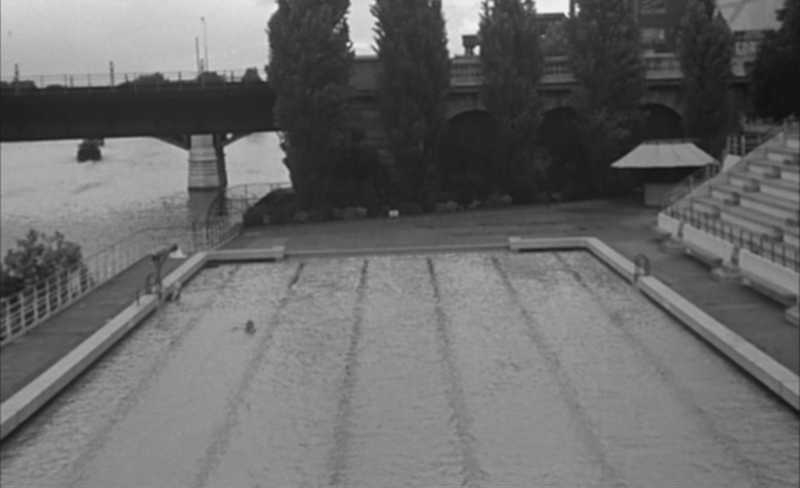 In particular, I can find no trace in the film of the specific places in Aubervilliers, Le Bourget, Champigny sur Marne, Colombes, Les Lilas, Noisy le Sec, Rosny sous Bois, Saint Maur des Fossés and Vitry sur Seine listed above. 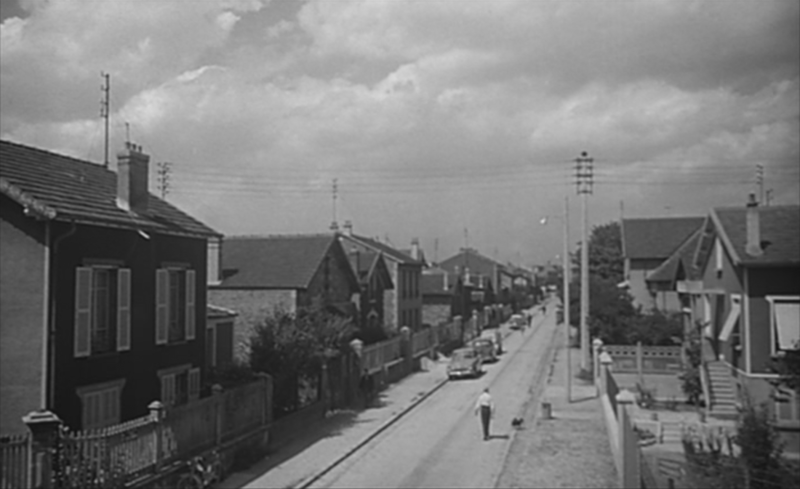 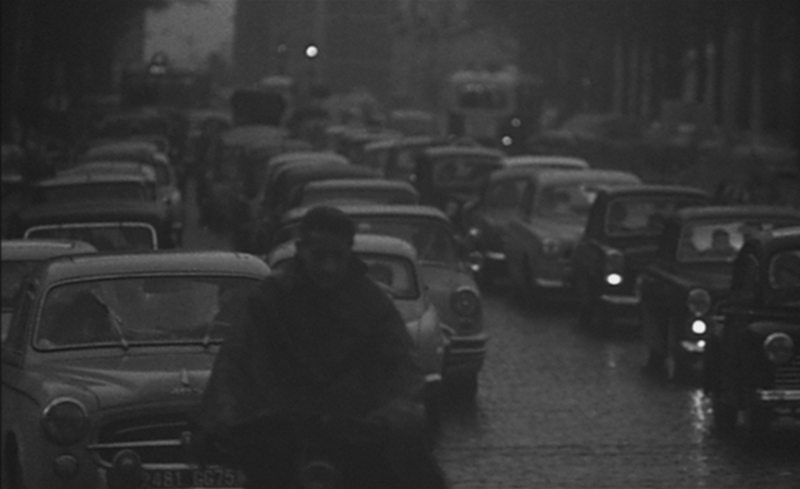 On th other hand, this list does not include locations in Asnières sur Seine, Bécon les Bruyères, Bobigny, Issy les Moulineaux, Juvisy sur Orge, Le Perreux, Levallois-Perret, Maisons-Alfort, Montreuil and Orly that are clearly in the film. 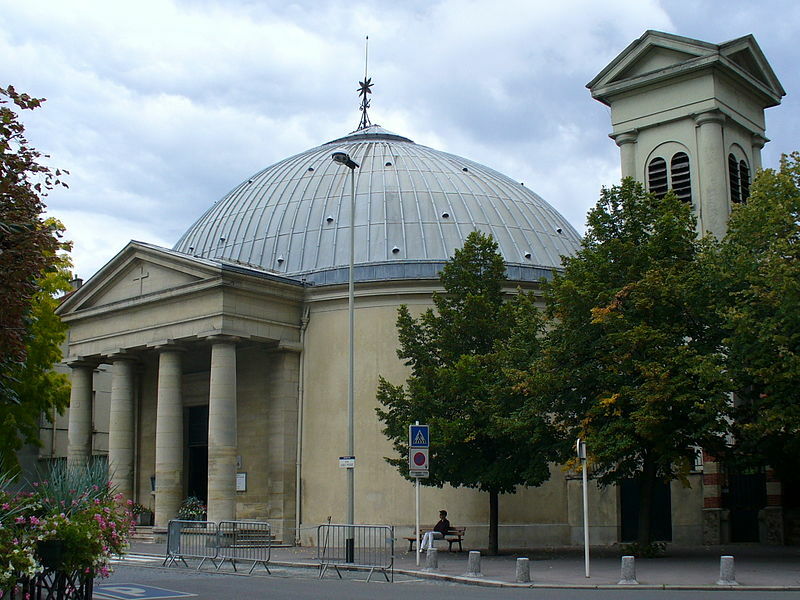 The list did help me find the cité in Fresnes. 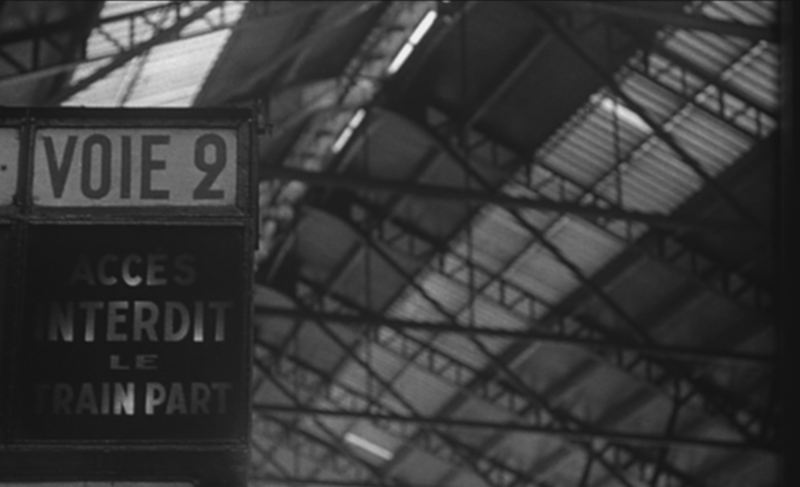 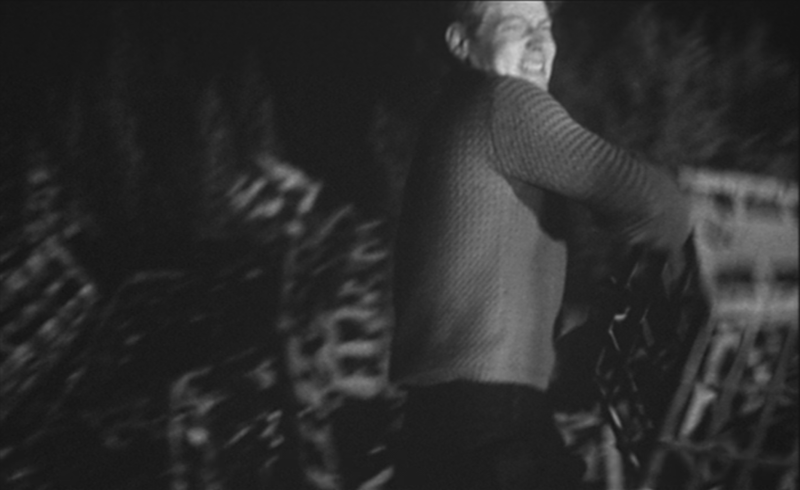 My conclusion is that this list is part of an early plan that was radically modified in the course of filming.